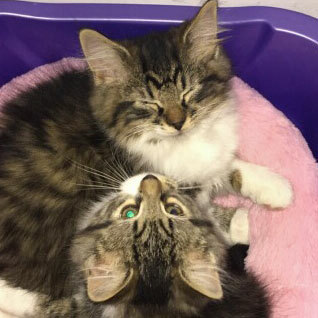 We're so happy to see them go to a forever home! 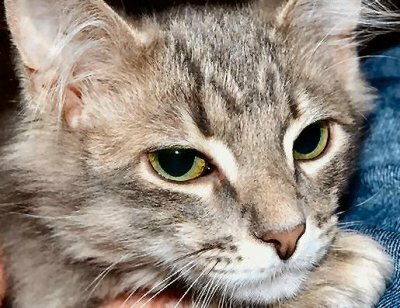 We would like to thank all of the adoptive parents who have taken the time to send photos and updates on their new feline family members. 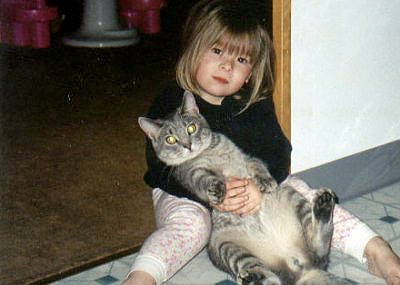 We are quite proud of our nearly 20 year history of placing adopted kitties. Browse our alumni by year here. 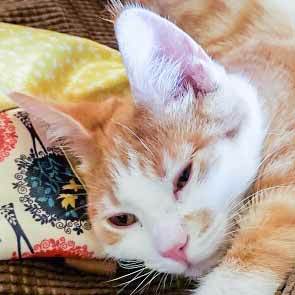 Our new kitten, Cuddles (formerly Wren), has been such a joy! 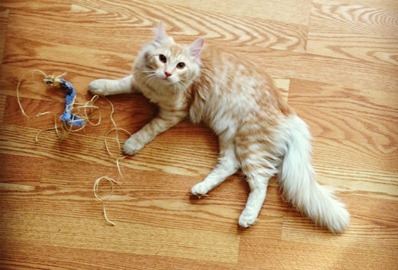 While she certainly lives up to her name, she is also more playful than we ever imagined. 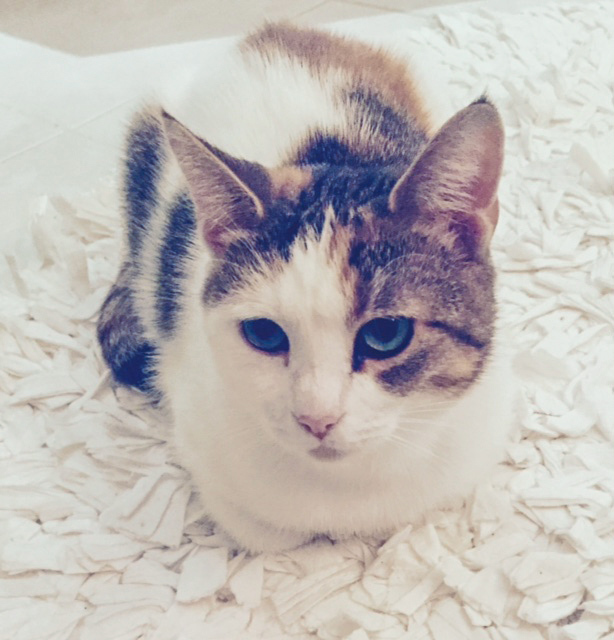 Our 2 senior cats, Cherry and KitKat, welcomed her into our home so quickly, and we couldn't be happier! Adopted July 2018. Marvin, formerly Dino, and Carl, formerly Eagle, are becoming good buddies!! Adopted July 2018. 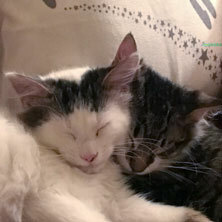 Buster & Jasmine adopted June 2018. 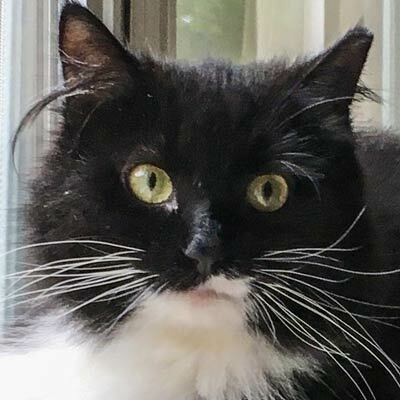 Lydia (formerly Aubrey, adopted June 2018) is doing great! and so so sweet! 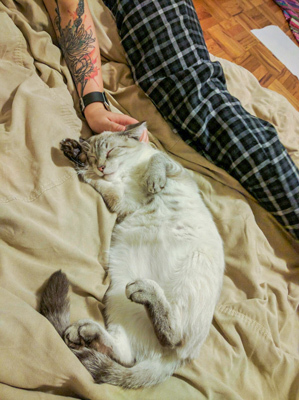 N.D.
Boris, adopted May 2018, cuddling with Carlos! 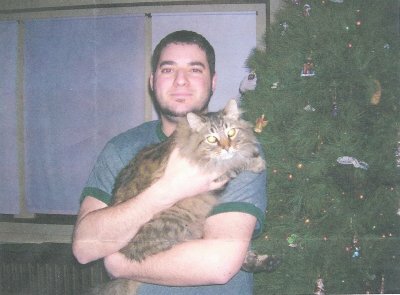 He is also good buddies with Kenny, not pictured. 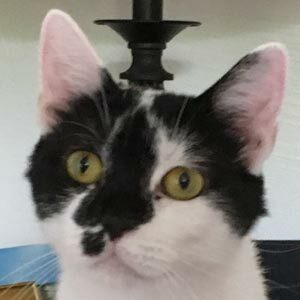 This is Lydia adopted May 2018. 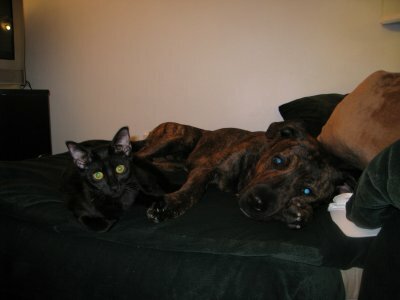 She and Lexi the dog have become best friends and are always together! 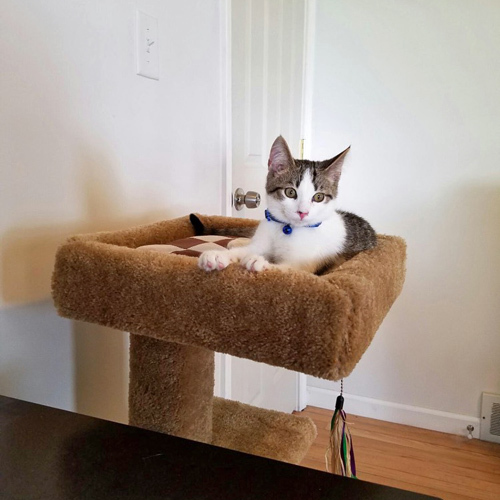 Puck, getting settled into his new home! 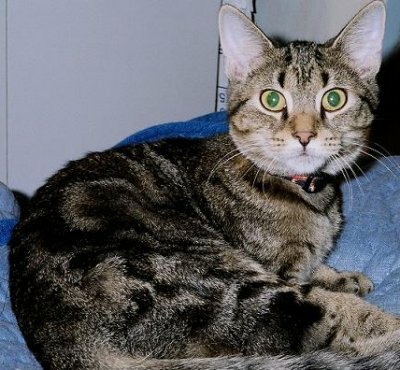 Adopted October 2018. He's great! Settled in very easily and quickly. Adopted August 2018. 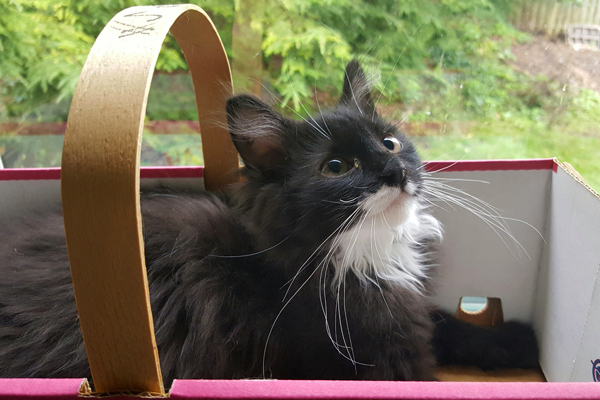 A picture of Louie in his new home (July 2017). 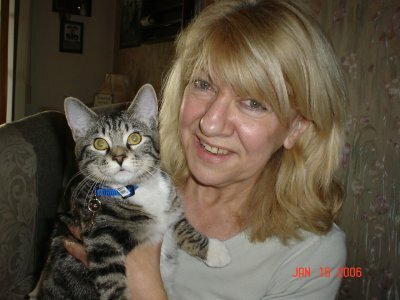 We connected the pet sitter to some CH sites on Facebook and this woman lives in New York and has 2 CH cats. Happy ending! 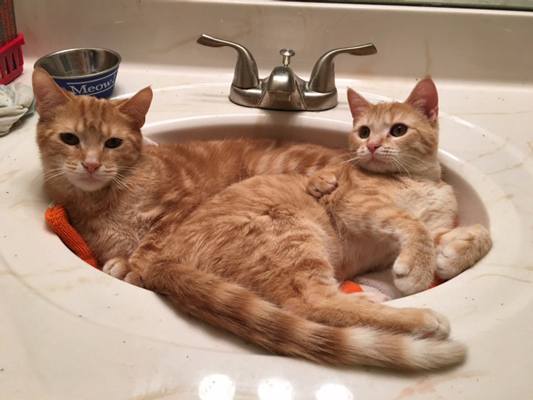 Tulip and Marigold, adopted June 2017. 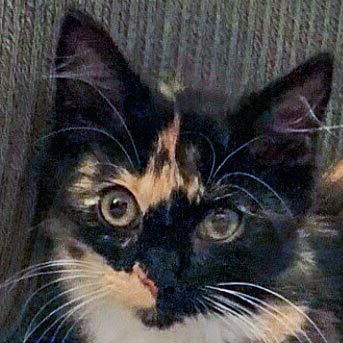 Mia (formerly Cammie), adopted May 2017, is doing very well. 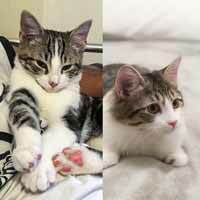 She and their younger male cat have become friends already and are playing together. The older cat is still not thrilled, but things are getting better. 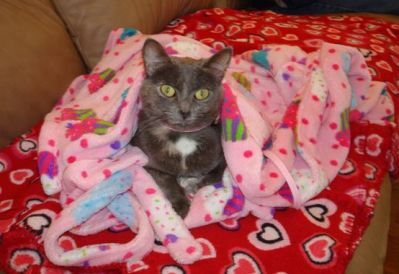 They say she is a “cupcake” -- loves to snuggle. They are very happy with her. 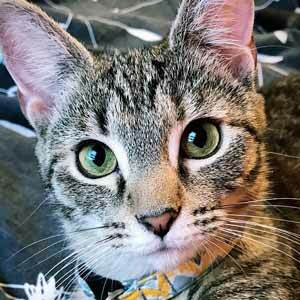 We fell in love with Pickles (Formerly Eden, adopted April 2017) 5 months ago when we she first came into our lives. She has not stopped burrowing her way into our hearts, and our faces ever since. 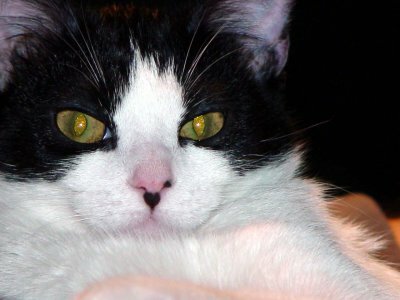 In fact, she loves to smash her little head into our faces to remind us she loves us. Pickles prances and gallops her way around our house just like a miniature horse and takes showers with us too. We are very fortunate to have her be a part of our lives. 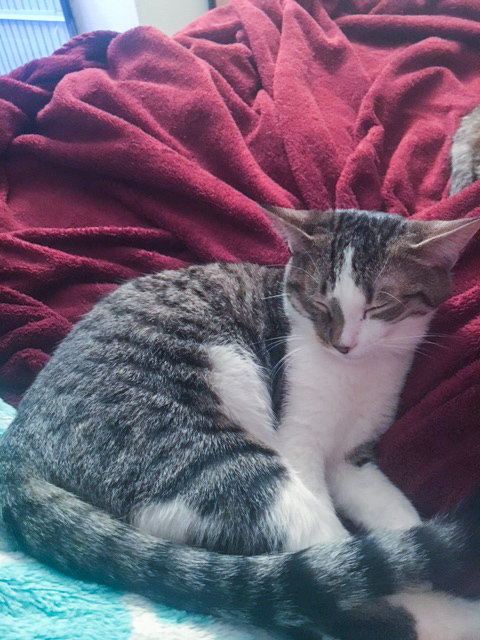 A picture of Abby (formerly Trinity, adopted March 2017) with her brother Jake. Nancy says she adores her. She sits in her lap all the time, but she doesn't like her husband, even though he keeps trying to make up to her. 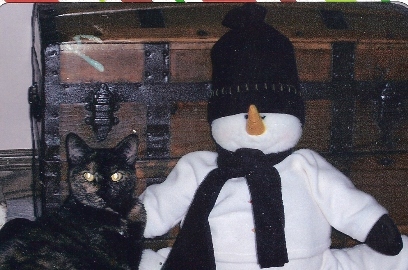 Jingle, formerly Candy, adopted December 2016. She is too sweet!! So loving and gentle!! 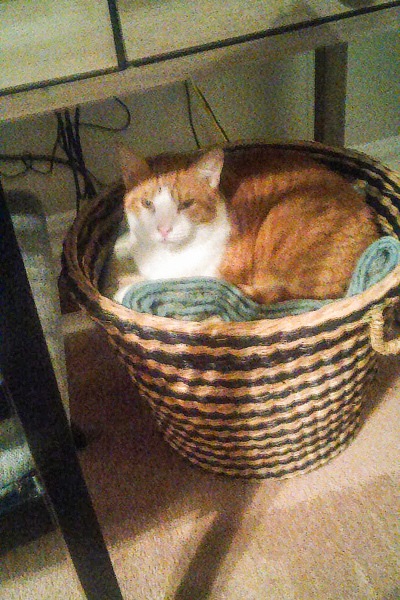 Captain Montgomery Meowskers, aka Monty, adopted Christmas Eve 2016, is fitting in perfectly and loves sleeping in the blanket basket! 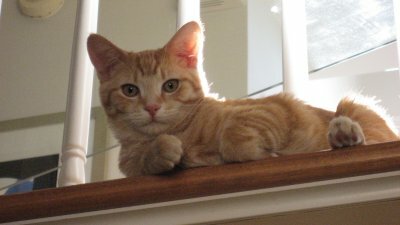 Jenkins (formerly Hercules), adopted November 2016. 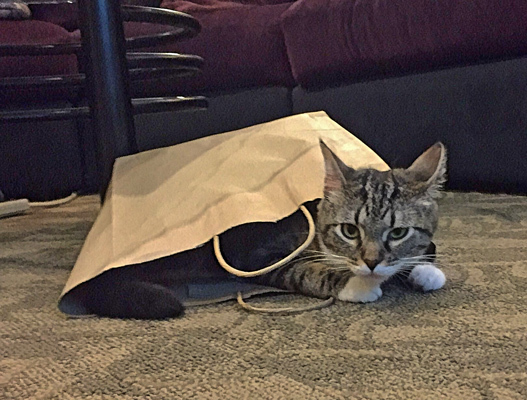 Wyatt (formerly Tonka), adopted September 2016, has adapted very well. 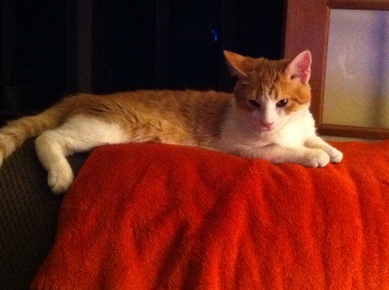 He and Stacia are making progress and he is making himself right at home! 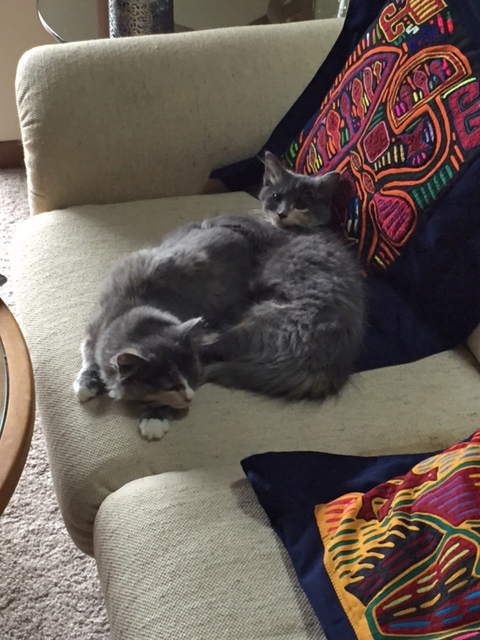 Dale & Anya, adopted August 2016. 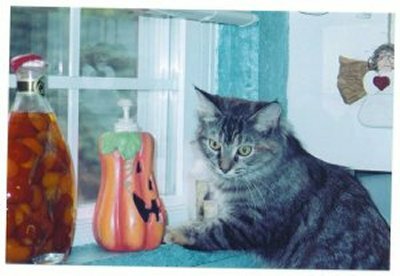 Here are some photos of Rocky aka Spooky adopted August 2016. 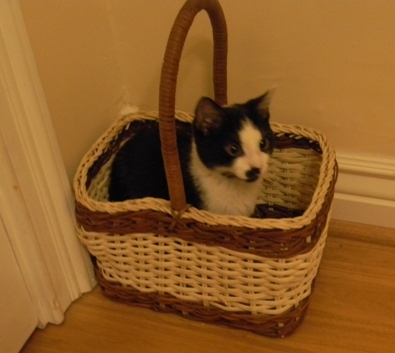 These were taken when he was in the back room sitting in a tomato basket on the windowsill. 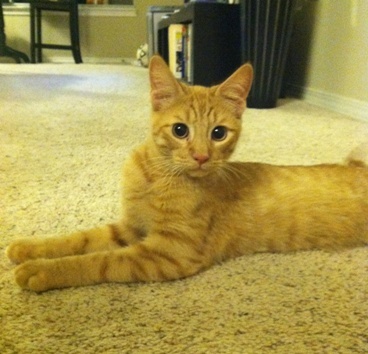 He is as sweet as can be and adjusting to his new home. I will keep you updated with photos. 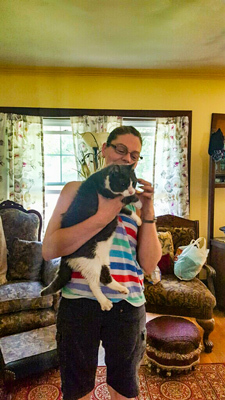 Mr.Mittens, formerly Dill, adopted July 2016, is really awesome. 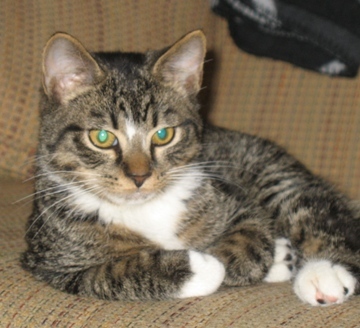 He isn't the least bit intimidated by the big dogs and has pretty much taken charge of the household. 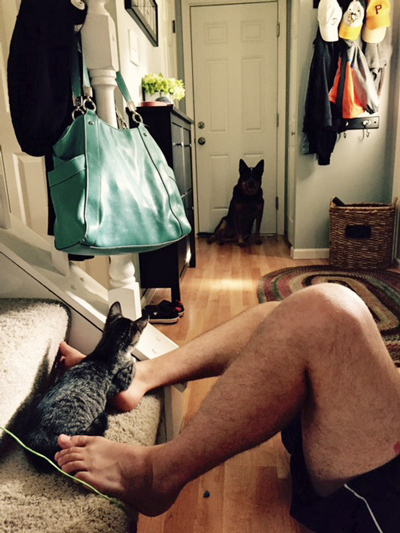 The dogs don't pay much attention to him, but he walks right up to them with no fear. He and the other cat are playing together and snuggling too. Mr.Mittens is also really good with his son -- follows him around and lets him pick him up and carry him around with no complaints. 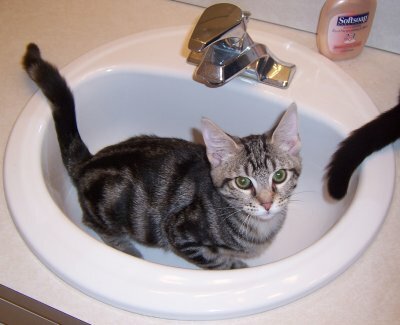 Dennis said he is the perfect fit. 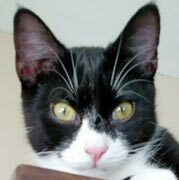 I think he said he sent you a photo to so please share so we'll have it for the Happy Tails and the website. 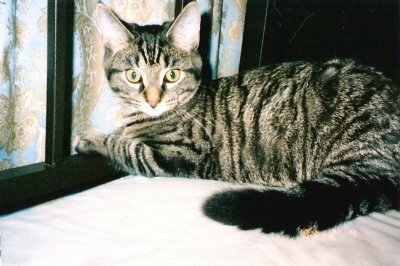 Allie, formerly Eirwen, adopted April 2016. Thought I would send you an update on Allie. She has been with us for a year today and she is doing well. She is such a joy to us! 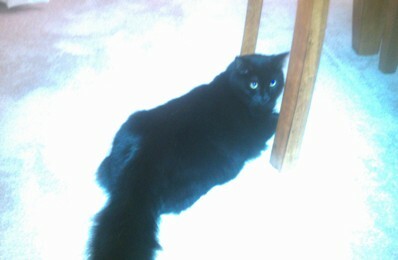 She struts around the house with that beautiful tail up in the air most of the time! We love her so much. 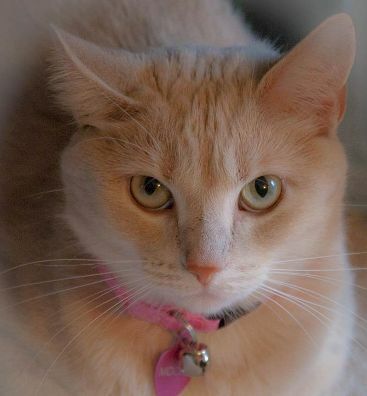 Lily, formerly Hazel, adopted April 2016. Finn & Winnie, formerly Colby & Clementine, adopted March 2016. Marty, formerly Marcus, adopted March 2016. 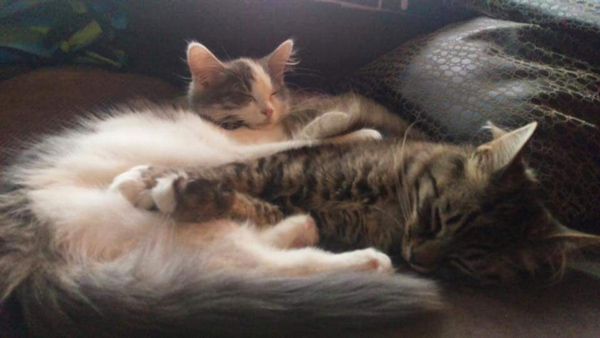 Marty is doing really well in his new home and his new sister, Tris, is finally starting to accept him. They will be one big happy family in no time! 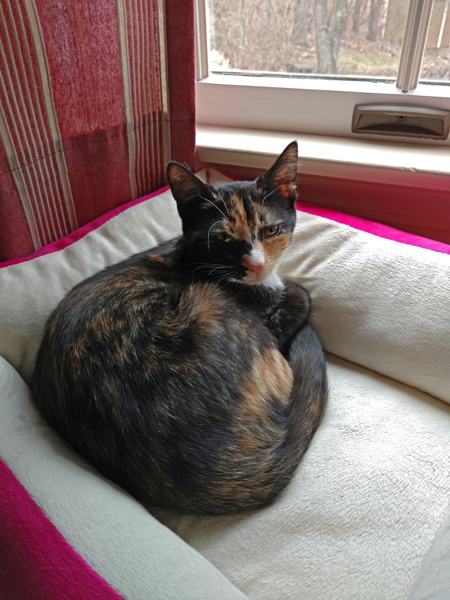 Cleo, adopted March 2016, is settling in nicely in her new home. She wasn't too sure about her new brother at first but you can see they are becoming best buddies now! 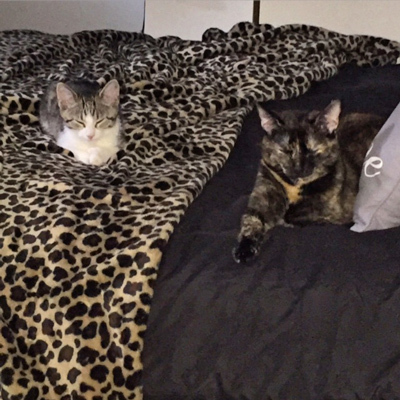 Looks like Serena and Venus (adopted January 2016) have settled right in. I like the names they chose for them. They will be spoiled. 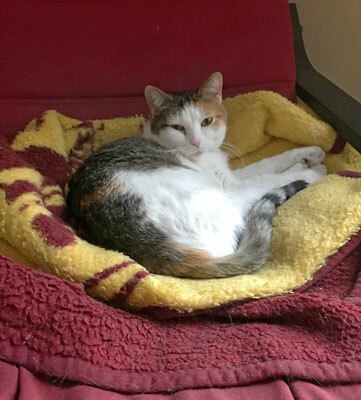 Angel (formerly Piper, adopted December 2015) is doing really well and Radio really loves her!! Jax in his new home. 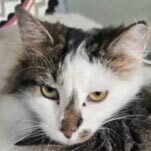 He is doing very well: eating like a pig, enjoying lap time, getting on reasonably well with the other cat and getting better with the dog, who is trying very hard to make friends with him. They like his name and plan to keep it. Charlie has adjusted well to her new home. 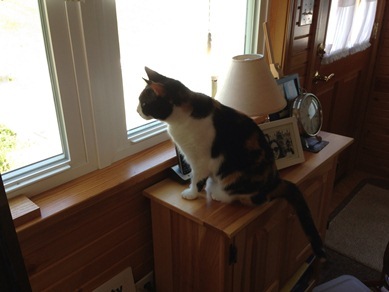 She likes to sit on her window seat and watch the outdoors. She's made friends with my sister's dog Buddy. She likes to ride in the car in her carrier with the seat belt on. She goes to camp on the weekends with me. 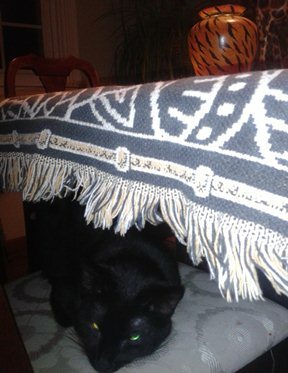 She's found her favorite spot there in a basket under the table that was just the right size. 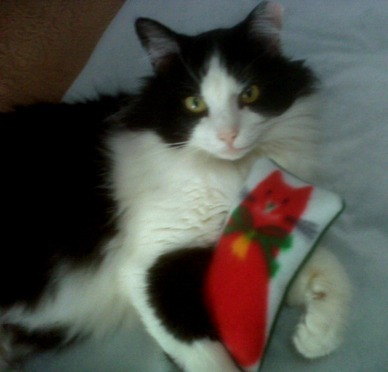 Her Christmas stocking is hung on the fireplace and she's waiting for Santa. Please tell the girls who cared for her that they did a wonderful job! I really enjoy Charlie. 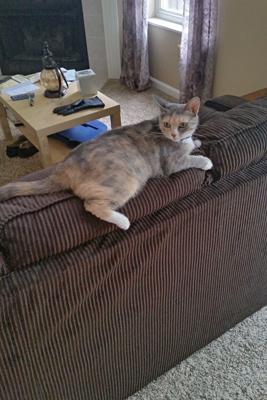 Lilly, formerly Aurora, adopted September 2015. 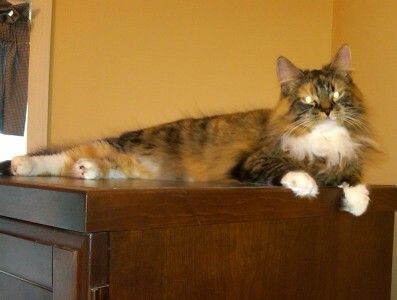 Aurora n/k/a “Lilly” has made a great transition to our home. 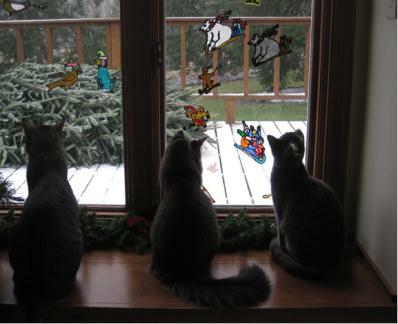 She is interacting positively with our two cats and has been very entertaining. She likes to fetch, which pleases our daughter, Emma, no end. 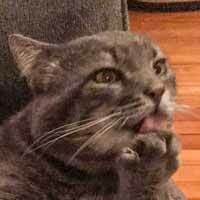 Emma has been posting photos of Lilly to Instagram regularly. 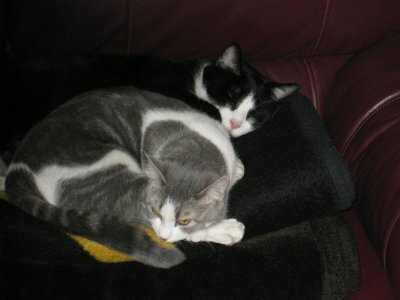 I took the attached photo of Lilly napping with Smudge Monday. 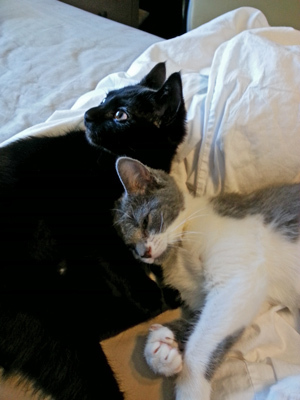 Tiberius and Amelia, adopted July 2015. 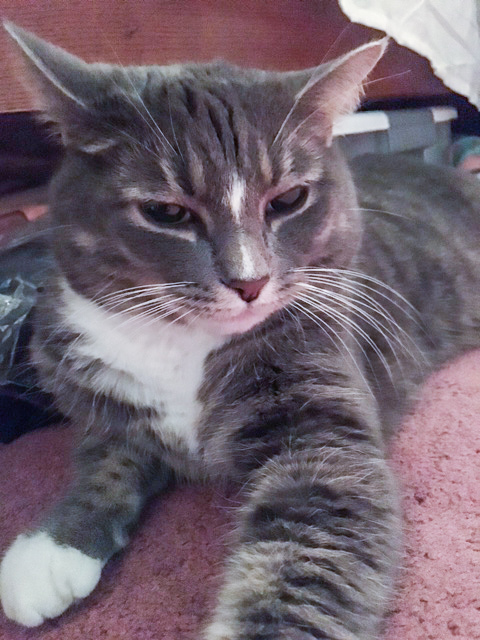 Atherton, formerly Gabriel, adopted July 2015. Here's a picture of Atherton for you! We took about a million pictures, but he's so active, it's hard to get a good shot. He usually comes out a blur! He's settling in great. He plays a lot, and we love playing with him. He and Mina were playing together really well yesterday. 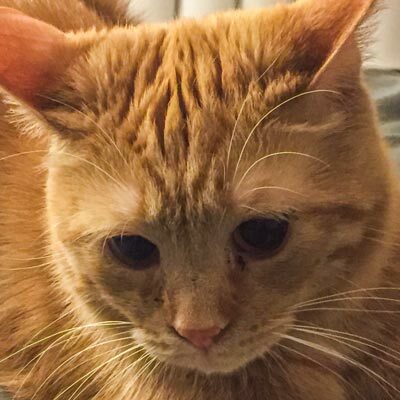 He's such a great kitty! 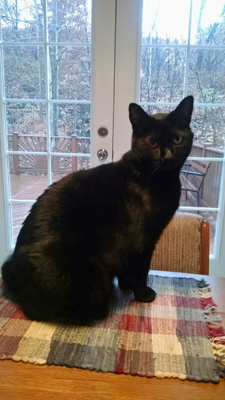 Joey, formerly Jay, adopted July 2015. Joey is interested but still very scared. 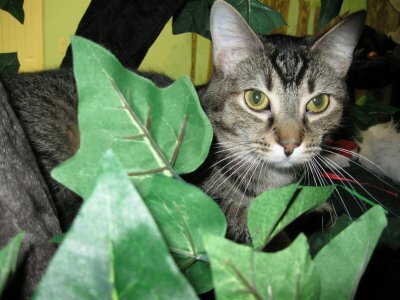 Not hiding at all and having a great time exploring! 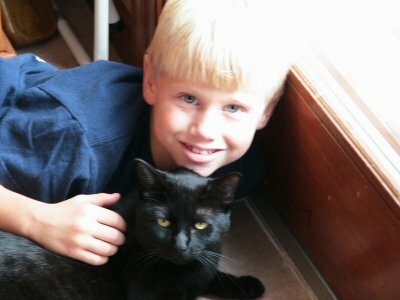 He loves Ben! 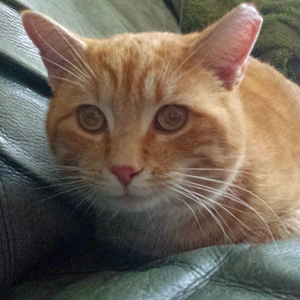 Oliver (formerly Theo), adopted June 2015. He is doing great and gets along great with their dog. 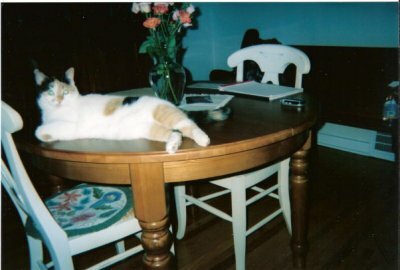 Her 3 year old calico, however, is not happy. 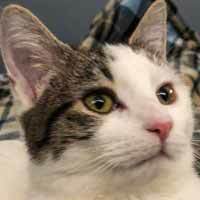 Dale, adopted April 2014, is doing great so far! 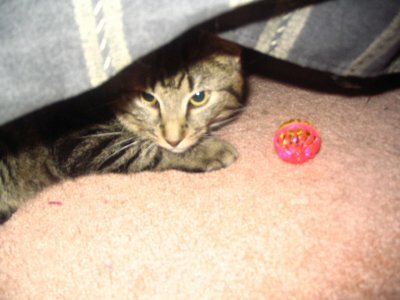 He was a little timid the first couple days and mostly hung out downstairs. But once he got used to all of us, he was just fine! He gets lots of attention from all of us, which he loves. He is a snuggler and had tried to sleep in bed with all of us! We trimmed his nails last night, which went very smoothly. 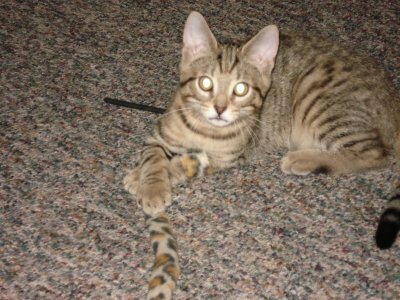 His favorite toy is a wand toy which my daughters love to run around with and get him to chase it. He seems very happy here so far and we are loving having him in our family! 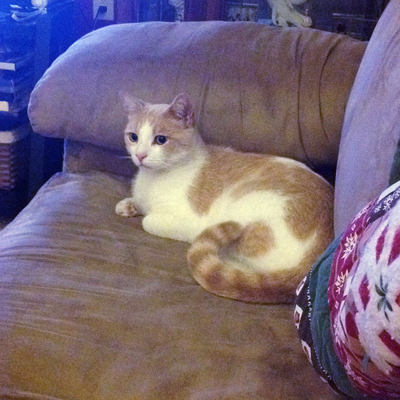 Here is a picture of Butterscotch (formerly Billy, adopted June 2014) lounging around. He is adjusting well. My other 3 cats are very interested in him, and follow him around when he is exploring. 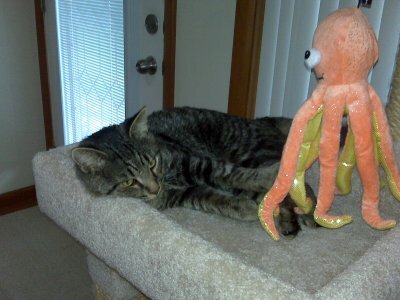 My cat Gracie really seems to like him and tries to get him to interact with her and play. But, baby steps. 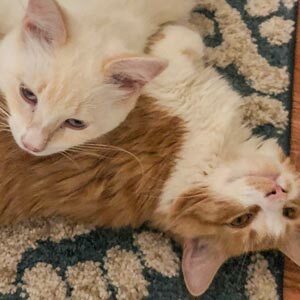 My cat kitties are all accepting each other, and that's great. We couldn't be happier that he is here with us. 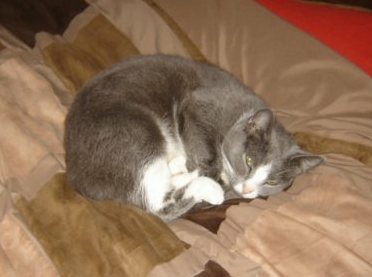 He enjoys sleeping on one of the beds, and picks a different one at will. It cracks us up that he lays against the pillows wherever he is. What a sweetie! 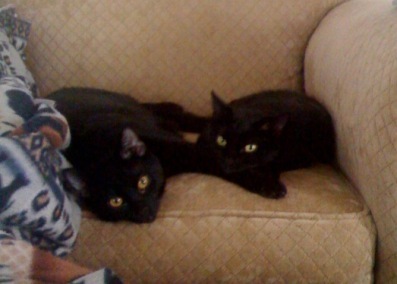 Lucy and Linus (black male, formerly Theo) snuggling. 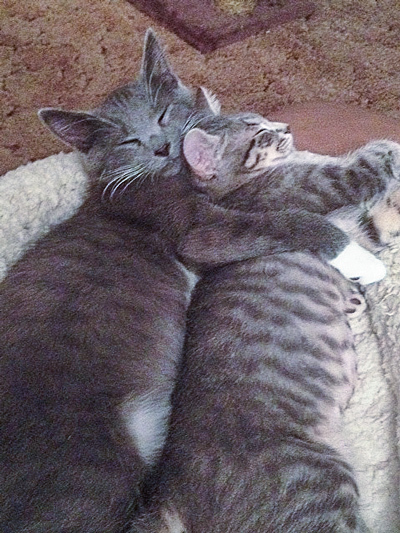 They are littermates adopted August 2014 and are doing great! 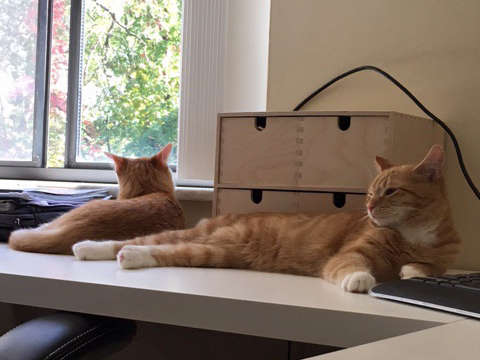 Alice, formerly Hazel, adopted October 2014, with her brother. They are getting along fine now and play together. 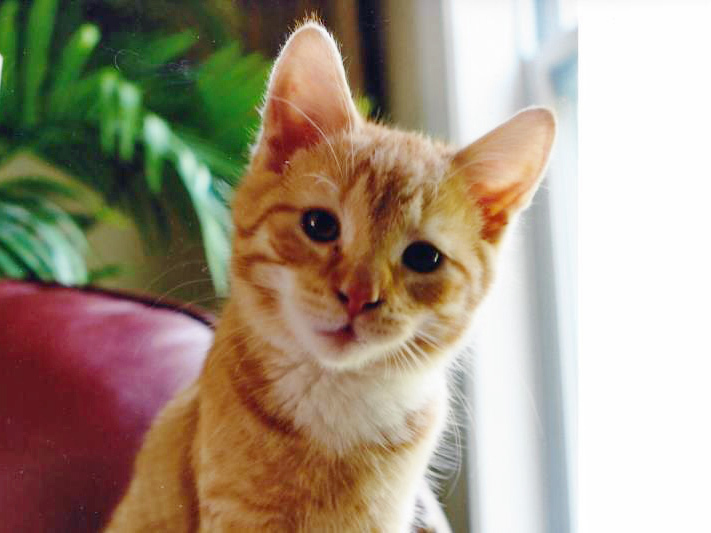 Eddie, adopted November 2014, has just completely won us over. He has decided that Penny — the two year old! — is his best bud. He is so patient with her, and he now snuggles with her every night at bedtime and is her alarm clock in the morning. We've taught her how to get the cats their dry food, so I'm sure that has something to do with it. I'm so appreciative to everyone who believed in him and gave him a second chance. He's such a great little guy. They came into my life a couple of weeks before Thanksgiving 2014 and gave me another reason to feel blessed. 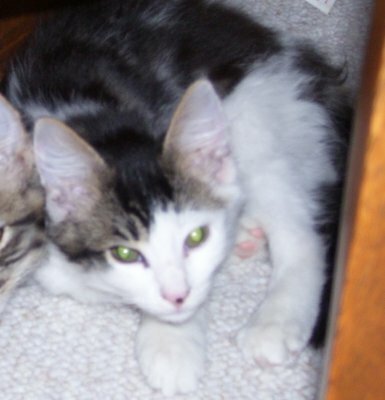 Of course, I must thank FosterCat and specifically their foster mother for taking care of them. Without Kim's healing touch I wouldn't be laughing as much as I do watching them play. I laughed so hard this morning there were tears in my ears. Thank you, thank you, thank you. Thought you might like to see Nacho (who is absolutely adorable). 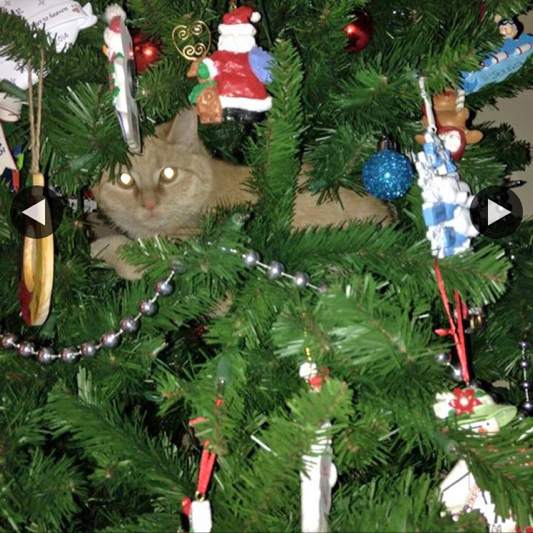 My granddaughter sent me this picture with the caption “Caught Red Handed” - Nacho found the christmas tree!! 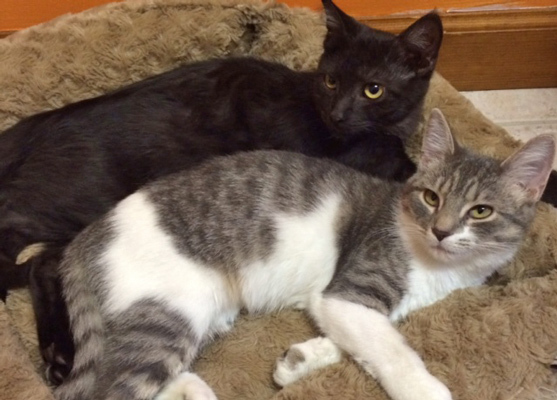 Here is a picture of Minx (formerly Maxi, adopted August 2014) and her brother, Charlie. 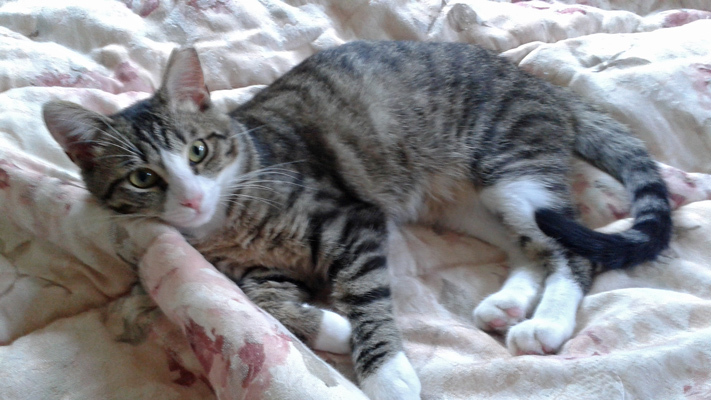 Minx is doing well and is 10 months old now. 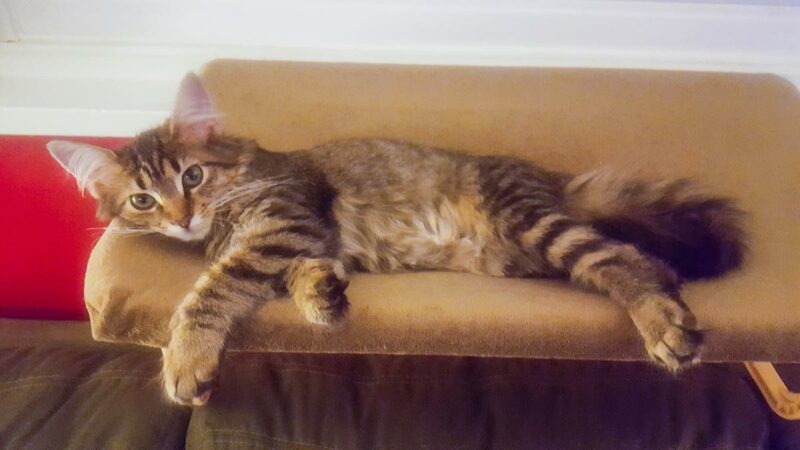 Charlie is 5 months old. 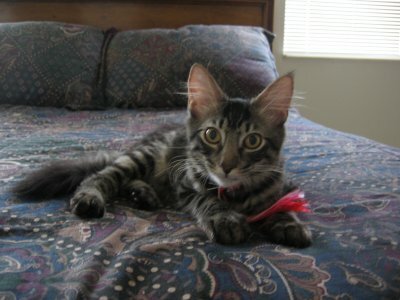 I adopted Charlie at 3 months old at my vet's office. 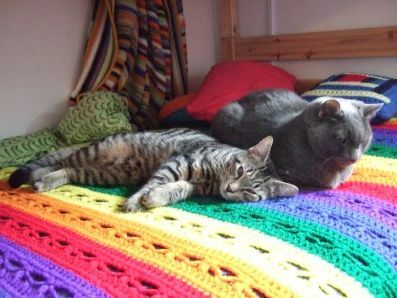 Minx and Charlie get along very well. 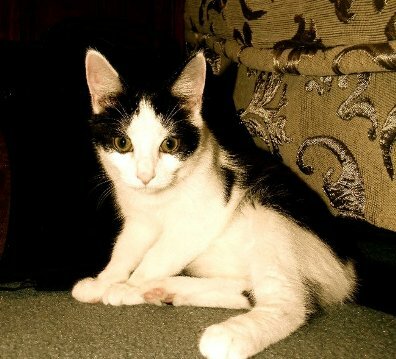 Minx is the mother Charlie was taken away from too soon and Charlie is the kitten Minx will never have. I love them both more than words can say. 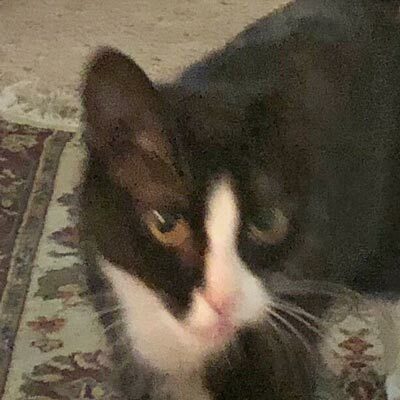 Just wanted to drop you a note and let you know that Minx has a good home and is loved very much. She has a forever home as does Charlie. 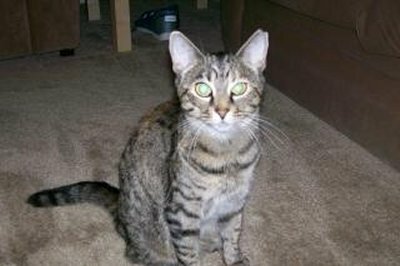 Thank you for letting me adopt Minx. She and Charlie make my life complete. 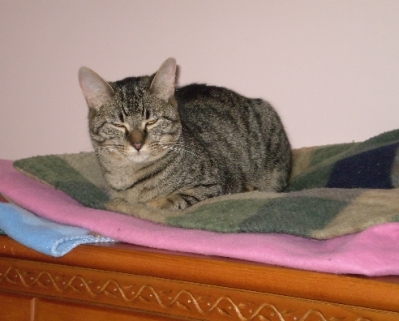 Dixie was adopted in May 2013. From her new home... Dixie and I are getting on just wonderful! We have become the closest friends ever! She receives love and returns it without reservation. What a wonderful companion she has turned out to be! 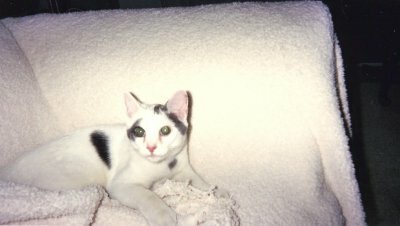 Thank you soooooo much for all you help with the adoption. 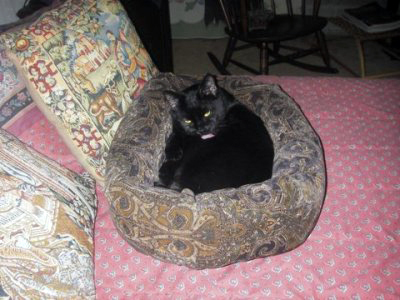 Bella was adopted in April 2013. 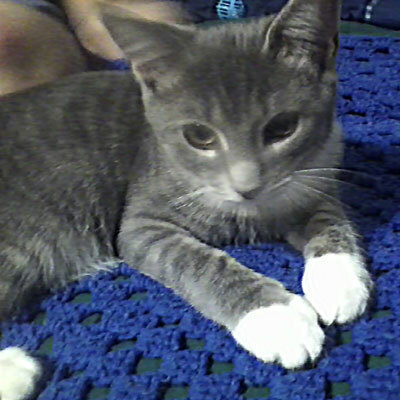 From her new home... Bella, or Pistachio Bella Rosa, or Tash or Bella for short... is doing very well. 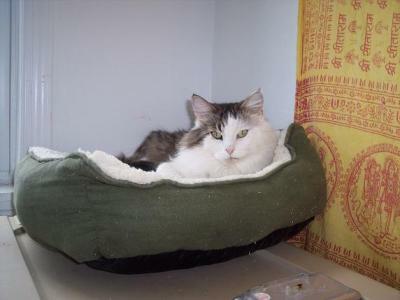 She is an awesome cat that loves to be petted and loves attention. 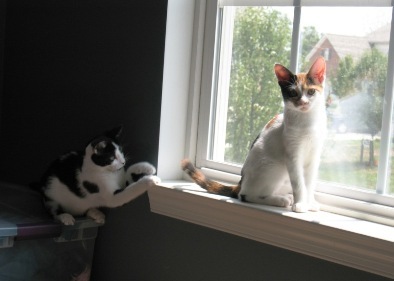 Holly and Cupid were both adopted in April 2013. From their new home... The kittens are doing very well! They have explored the whole first floor of our house and have met the dog without too much stress! Now the dog and the cats are getting along well. 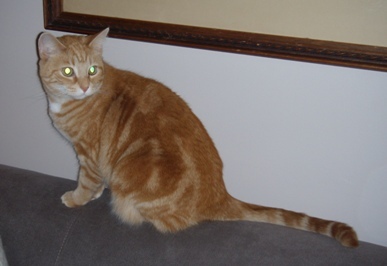 Ben was adopted in March 2013. 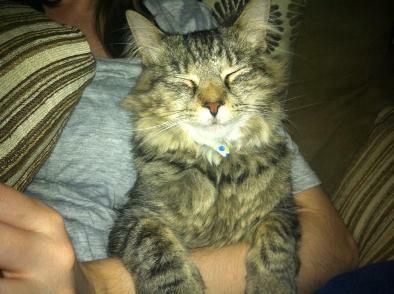 From Ben's new forever home... Ben is doing great! 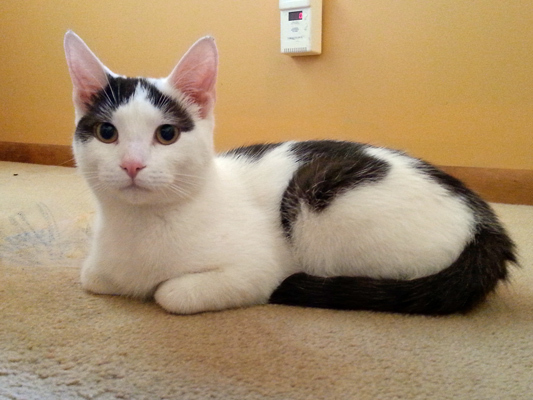 He made himself immediately at home, is eating well and using the litter box with no issues. 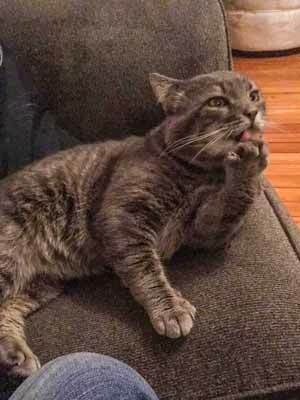 He doesn't scratch anything. 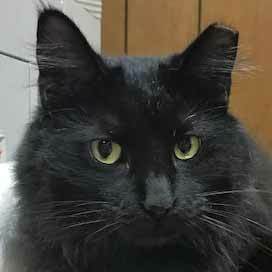 He is very good with the kids, sleeps with them every night, and loves to be where they are. 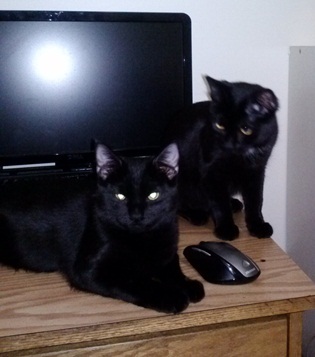 Smoke and Mirrors, formerly Mickey and Minnie, were adopted in February 2013. From their new home... Smoke and Mirrors have settled in, and I think the place might be more theirs than mine at this point. I've decided to call them Smoke and Mirrors, but I call her Miri for short. I thought it sounded really cute together, and it works with their coloring. It is amazing to see how different their personalities are, you notice new things every day. 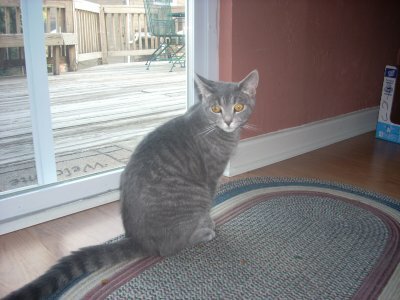 Smoke is definitely the personable one, and willing to make friends with anyone as soon as they walk in the door. 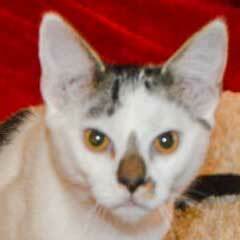 Miri is a little more timid, but once she gets to know you she's extremely loving and playful. They are keeping me on my toes, that's for sure! 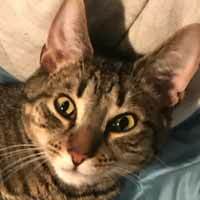 I hope you like the pics I send, I have a bunch but I'm trying to send only the ones that have both of them, and that aren't blurry from them running around. 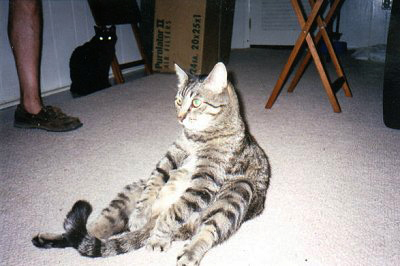 I am going to send you the one really funny one I took however. 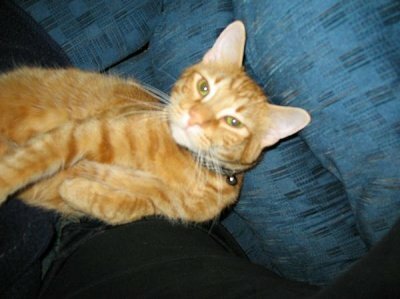 Miri decided to curl up in my lap, and Smoke decided he wanted to play with her tail. Its a good one! 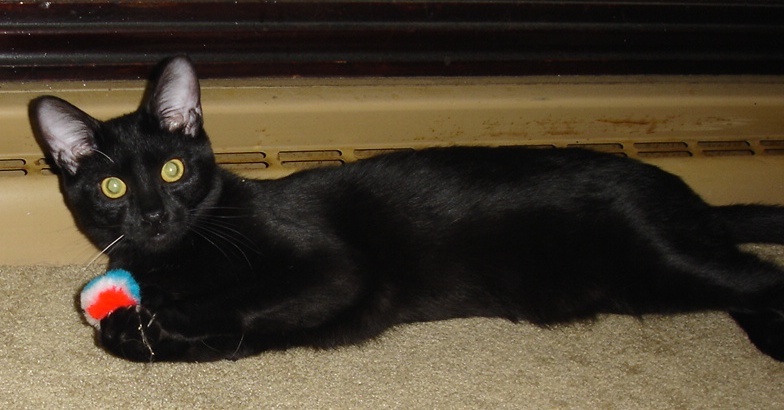 Jordan, aka Simon, was adopted in January 2013. 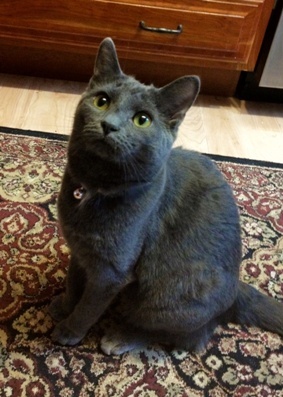 Maddie (adopted September 2013) is doing fine. 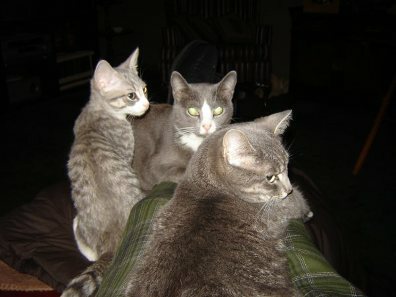 As you can see from the picture, she, Possum, & Friskie are getting along fine. She sleeps with me (along with the other 2) and all is well. She is very vocal. When she wants her treats, she really lets me hear about it. 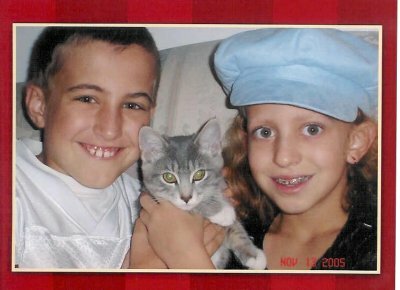 Thank you again for allowing Maddie into our lives. 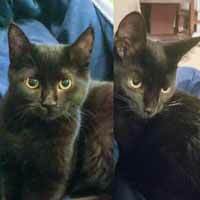 Opal and Onyx (now Abby and Nyx), adopted December 2013, are playful, loving and very sweet, and love each other very much. 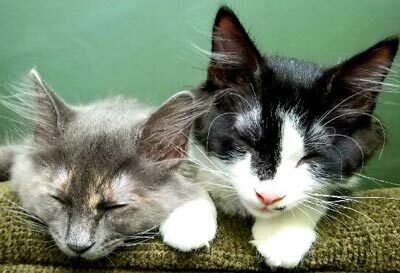 Whoever fostered them did a great job helping them socialize with people. A big thank you to them too! Our family is now complete! 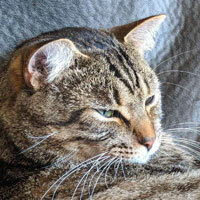 Arlo, fomerly Jonas, was adopted in November 2012. From his new home... We adopted our best friend Arlo (formerly Jonas) in November and just wanted to let you know how well he is doing and how much we love him. He is our loyal buddy. We call him the cat dog, bulldog cat, and the best dog ever because he has such a dog-like demeanor and is such a constant companion. 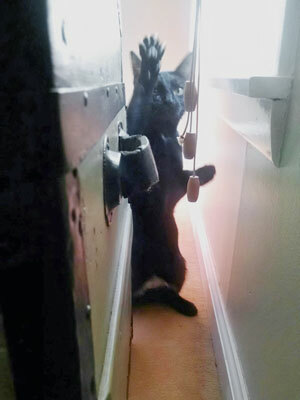 He has tons of enthusiasm, greeting us at the door when we get home and playing staircase fetch. 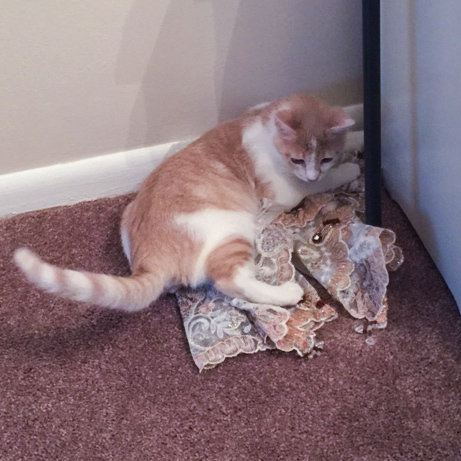 He loves his new house and still explores every inch on a daily basis, just to make sure nothing has changed. 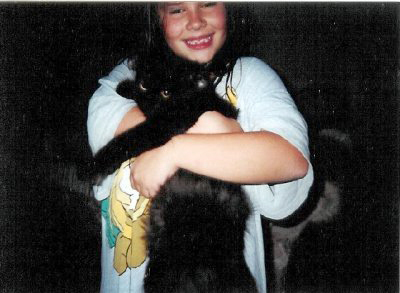 We just wanted to thank you for taking care of him so well in the first year of his life. 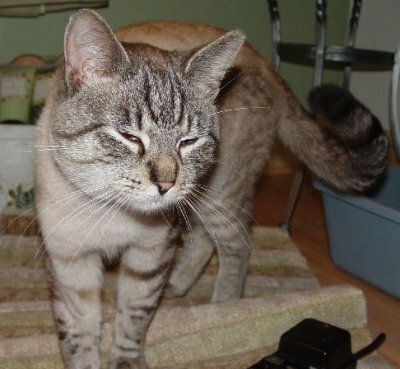 He's a gentle, polite, funny, and confident boy who is so sweet and loving to his people. (And he's even a good sport about wearing a Penn State jersey. It makes my husband so happy!) He adds so much joy and fun to our daily lives. We couldn't imagine this household without him. 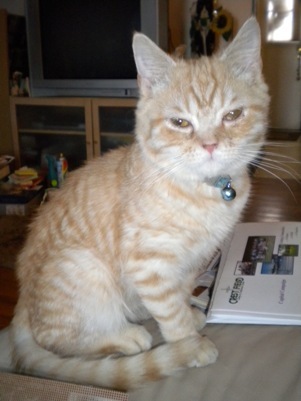 Here is a photo of Alfie, who was adopted in December 2012. 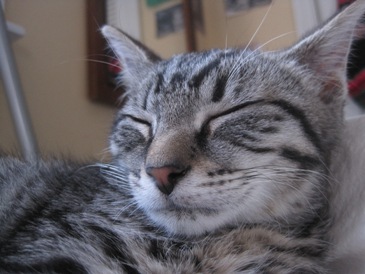 Maxim, formerly Meow Tse Tung, was adopted in December 2012. From his new home... 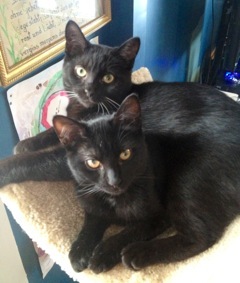 Here is a photo of Maxim with his sister, Mia. Maxim is on the left and Mia is on the right with her head resting on his paw. They are just so adorable and so much fun! 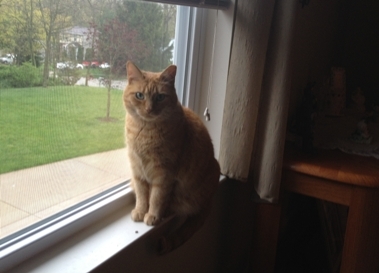 Leo, formerly Napawleon, was adopted in November 2012. 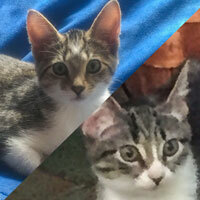 Willow and Whiskers, formerly Noah and Blue, were adopted in October 2012. From their new home... 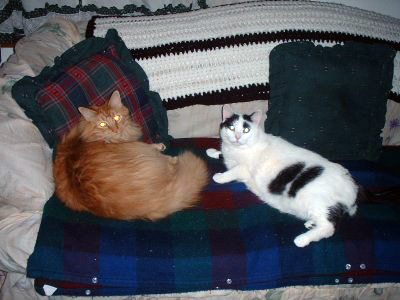 This is where Willow and Whiskers sit each day while waiting for the girls to get off the school bus. I tried to get a picture when they were dressed up and riding in the girls strollers. 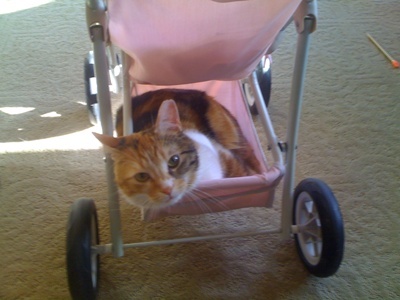 Amazingly they love to sit in the strollers and ride throughout the house. That is of course probably because they are taller than Bazooka and Sparkles and they like to swat them as they go past. So funny to watch. 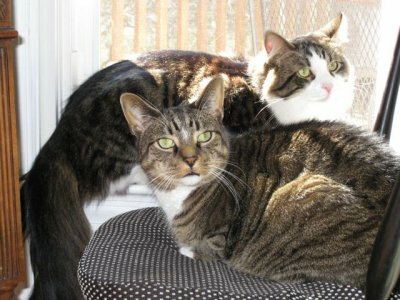 They are so amazingly friendly to anyone who comes to the house and I can’t recall a time they were not purring. I took a picture on my cell that I have to try to get to you. 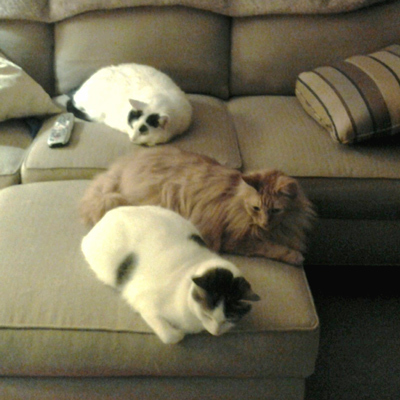 It is all 4 of them rolled up on the couch. And honestly they look like one massive ball of fur. 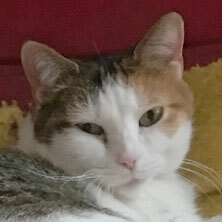 Sophie, formerly Puss, was adopted in August 2012. 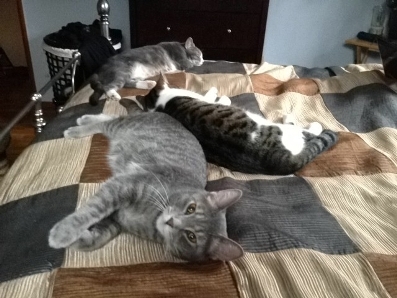 From her new home... Sophie is having a great time with her brothers Boo and Jeffrey. She has taken up the need to chase and wrestle with them on a regular basis. Good for all three. And we love having her around. 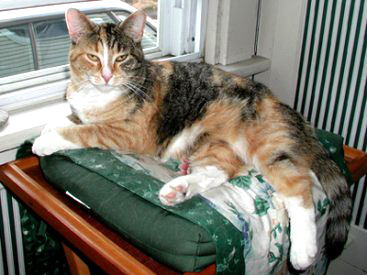 Zoey was adopted in October of 2012. From her new home... 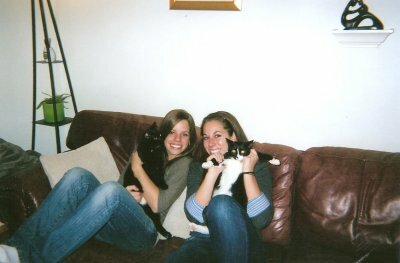 Here are some pictures of Zoey and a couple of her with her older sister. 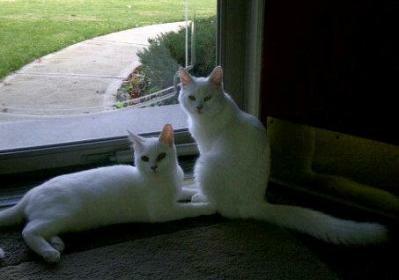 Dixie and Daisy were adopted in October 2012. 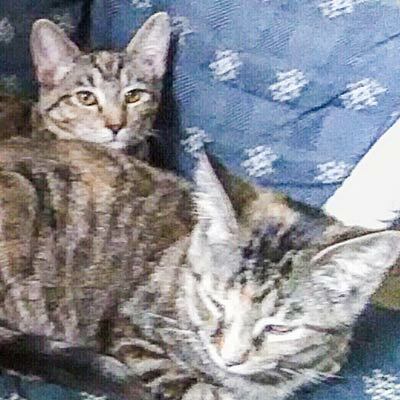 From their new home... Daisy and Dixie became part of our household almost a month ago but it feels like they have been here as long as we have. 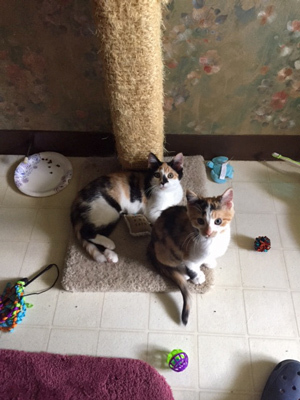 Daisy and Dixie are 7 month old sisters. 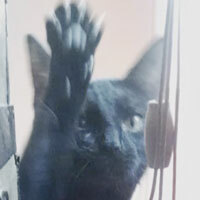 When we come home from work the cats greet us at the door. 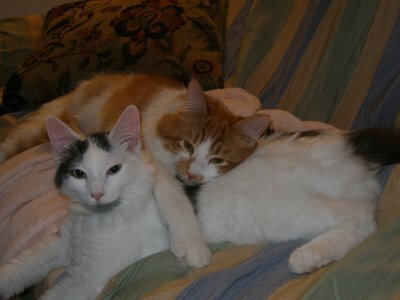 It is so nice to come home to two such loving and playful cats. 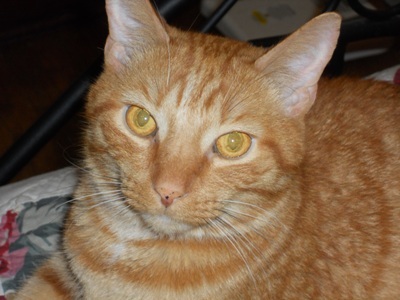 Chuck, formerly Logan, was adopted in October 2012. From his new home... 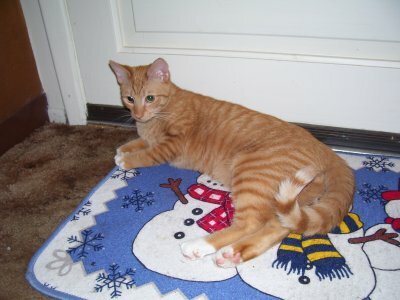 Here are some pictures of Chuck, or Little C as we now call him! We are all really enjoying playing and snuggling with him, and he is really loving being here. 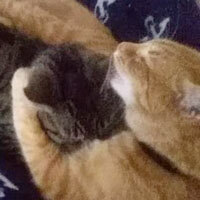 I hope that eventually he will be able to snuggle with our older cat, Abby. 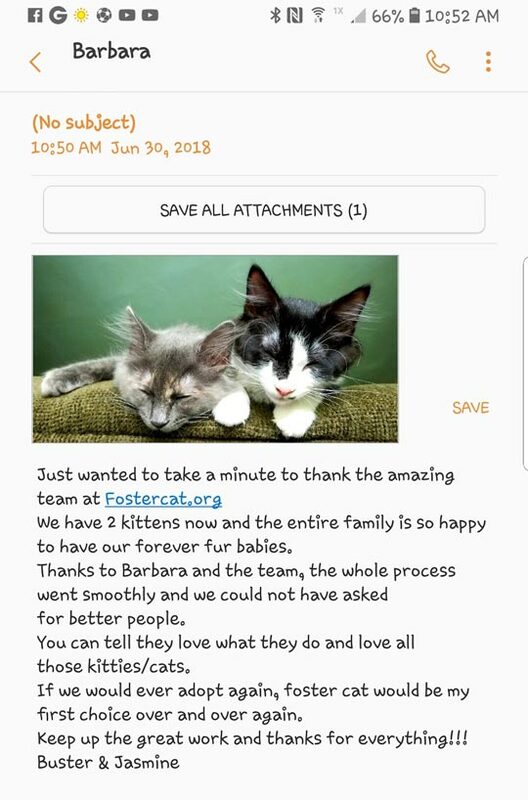 Thanks again and I will definitely contact you guys in the future if we are ever ready for another cat. 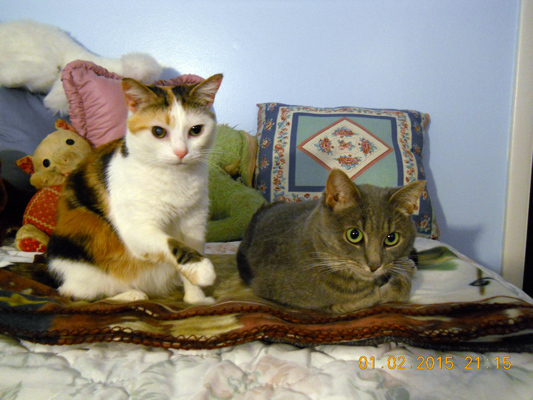 Gracie and Sophie (formerly Bella and Hazel) were adopted in August 2012. From their new home... 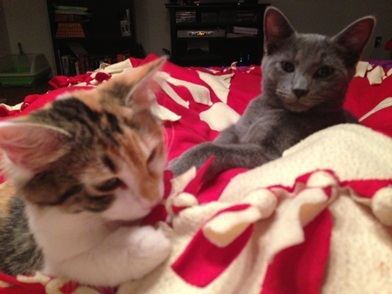 Here is an updated pic of Gracie & Sophie (formerly Bella & Hazel). They are hilarious. 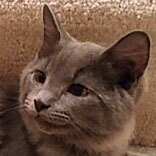 Gracie is real outgoing and verbal. Sophie is still a little shy but she's coming around. They come up on the couch with us when we're watching TV. When we go to bed, they come up and sleep with each other at the bottom of the bed. Gracie knows that we keep her toy-on-a-stick up on the shelf in my office. She will reach up and pull it down when she wants to play with it. 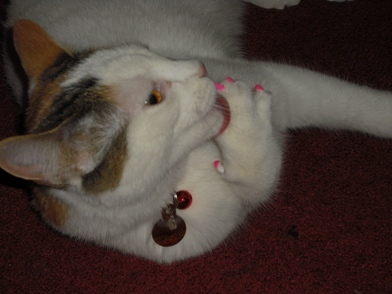 She also knows that I keep treats in two places: under the kitchen sink and in the credenza in my office. She's pretty smart! 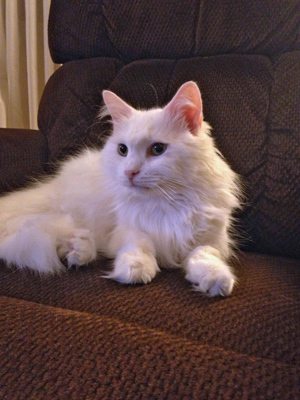 Sophie is a little more aloof but she's still a sweetie. She won't cuddle with me but she still wants me to know that she's there so she'll come to about a paw's length away and just put her paw on my foot or my arm. They are quite funny together. They had a slap fest yesterday where they stood facing each other for about 20 seconds and took turns slapping each other across the face. 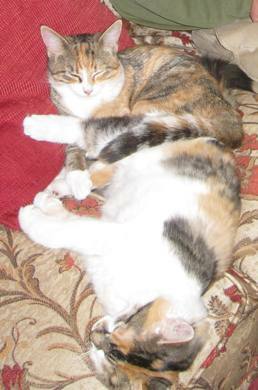 Sophie will often pin Gracie to the carpet in a head lock and lick her ears. Sophie is usually the instigator. They have adjusted pretty well to the house. 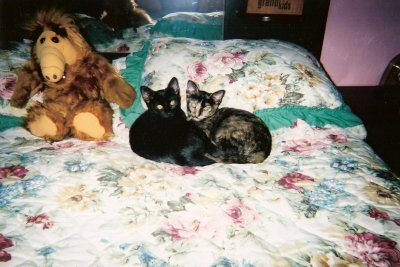 For the first few weeks we kept them confined to the guest bedroom. Now they have free run of the entire house. It's funny though that when they feel threatened they retreat to their bedroom. 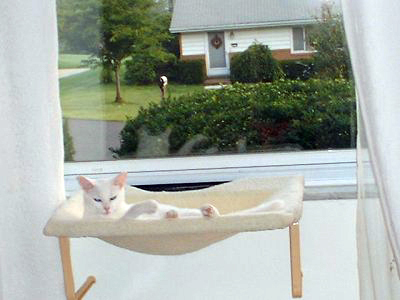 They seem to be most comfortable there and will frequently return there. 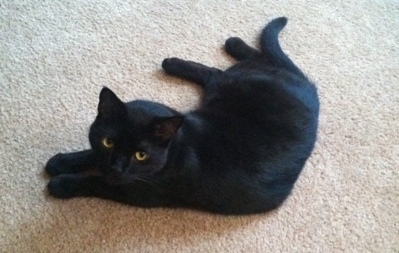 Jade was adopted in September 2012. 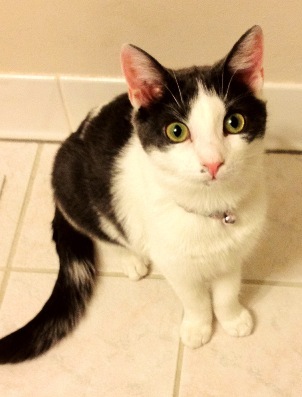 From her new home... Jade was adopted in September of 2012. From her new home... 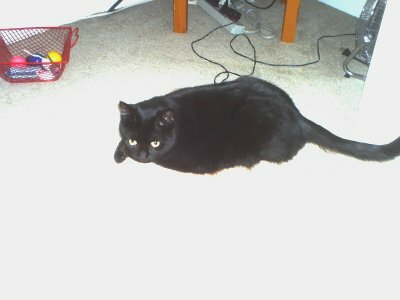 Here are some pictures of Jade. 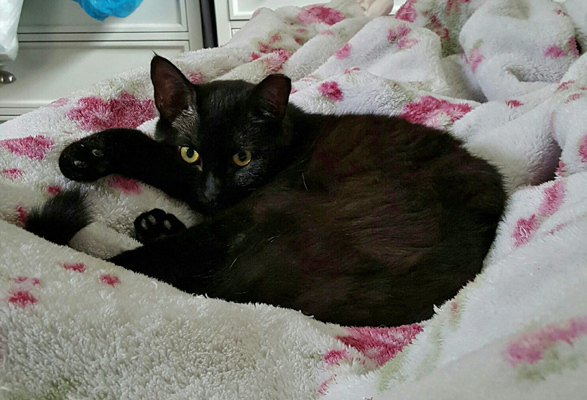 She's doing wonderful, healthy, and is very playful throughout the day and sometimes night. We're so glad we could adopt her! 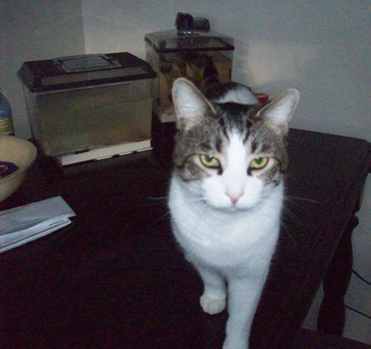 Skippy was adopted in September 2012. 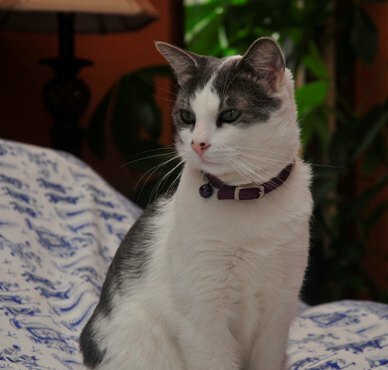 Mr. Big was adopted in June 2012. 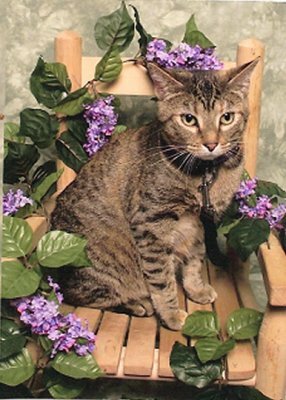 Lilac was adopted in September 2012. 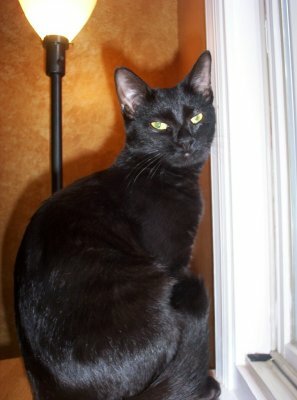 Ashes (formerly known as Junebug) was adopted in February 2012 along with Cinders (formerly known as Maybelle). 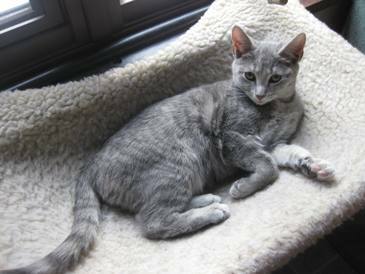 Cinders (formerly known as Maybelle) was adopted in February 2012 along with Ashes (formerly known as Junebug). 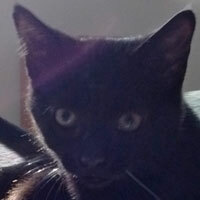 Angus (formerly known as Rocky or the HOV kitten) was adopted in January 2012 and is thriving. 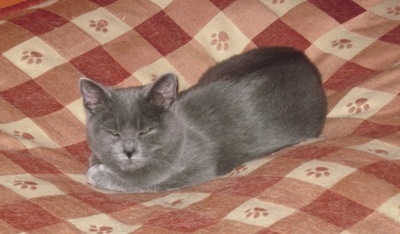 From his new home... His spirit captivates everyone and he teaches us daily about the joys of life. 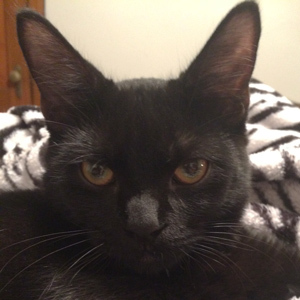 He is very playful and loving with a boisterous purr. Our family is blessed by his sweet presence. 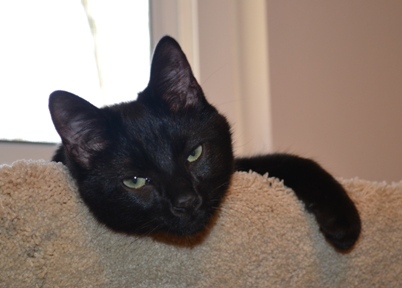 Angus wants to thank everyone who cared for him when he needed it most. Felix is doing very well. 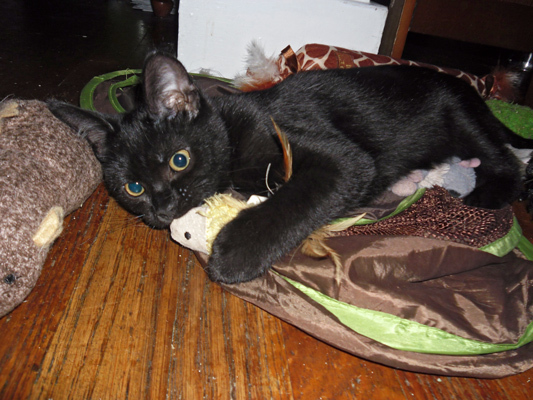 I got him a catnip mouse that he absolutely loves! He's been on my lap purring since I got home! 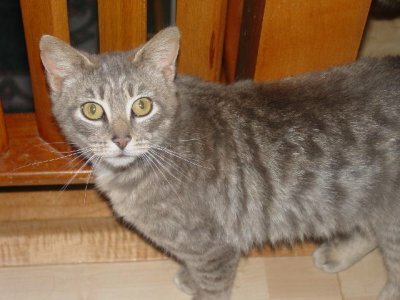 Squeeky, formerly, Willoughby was adopted in March 2011. 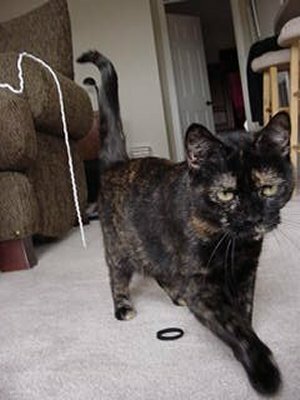 Penny, formerly Miss Kitty, was adopted in October 2011 by the same people who adopted Sissy back in December of 2009. 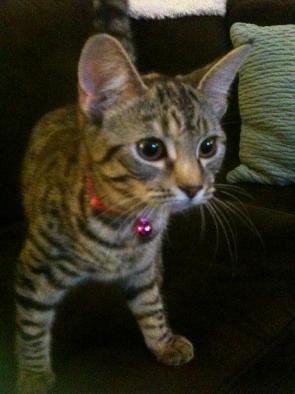 From Penny's new home... Penny is doing well. She has adjusted to us and the rest of the kitties and has become part of the family. 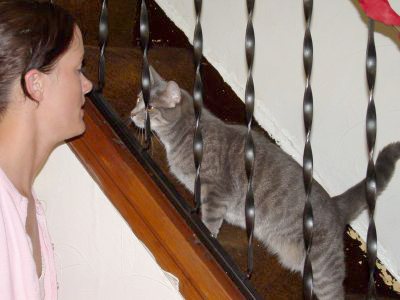 She likes to sit at the front door on a sunny afternoon and will even engage in a game of tag with Sissy. She is a very sweet kitty. 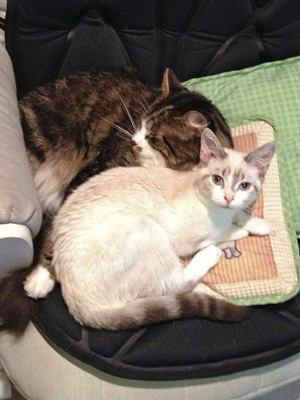 Larry (Siamese mix), with his new brother Punkin. 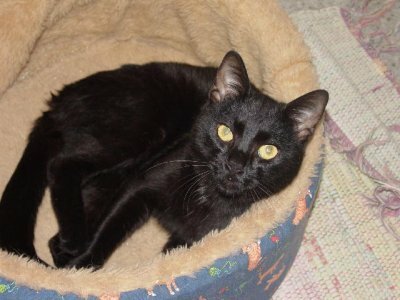 Larry was adopted in November 2011. Curly was adopted in December 2011. From his new home... 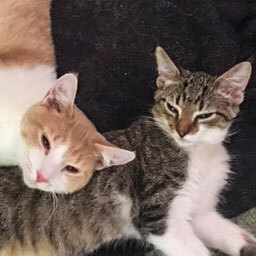 Both Curly (the kitten) and Tiger were adopted from FosterCat. 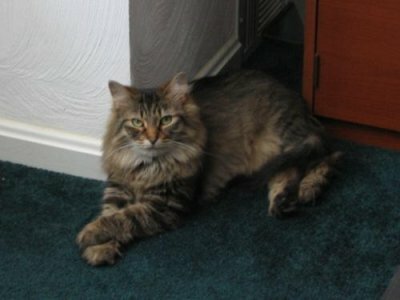 Tiger was adopted two years ago and Curly, just this past December. From their new home... Here is a picture of the dynamic duo! They are best friends now. Right before I took the picture, they had their heads together. It was so cute, but when I went to get the camera, they moved their heads apart. Still cute to see them together, but there is also one of just Curly, too! 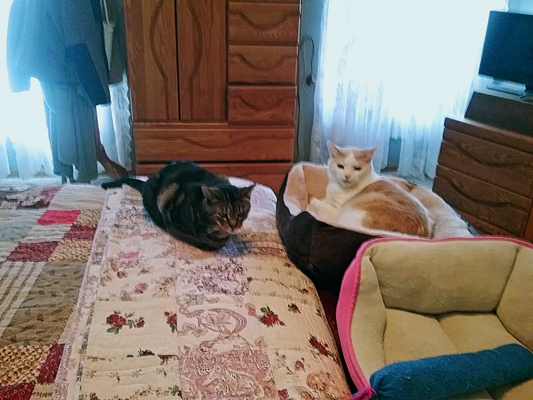 Here is a picture of Hershey sleeping on Frank's bed with his new friend, Fergus. 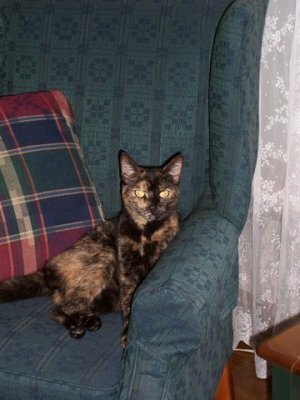 Hopefully, our other kitty, Pixel, will want to be Hershey's friend soon. 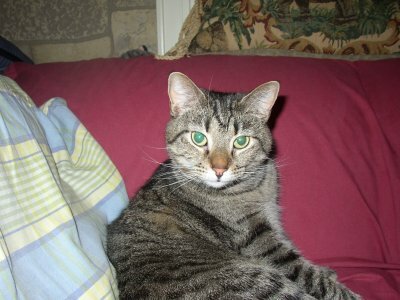 Buster was adopted in December 2011. 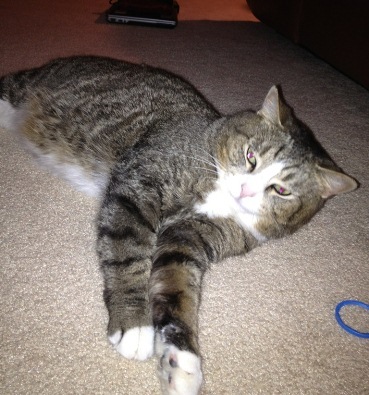 From his new home... Buster is doing very well! 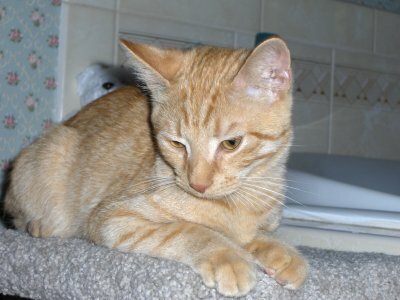 He is very playful but not overly energetic which is nice. 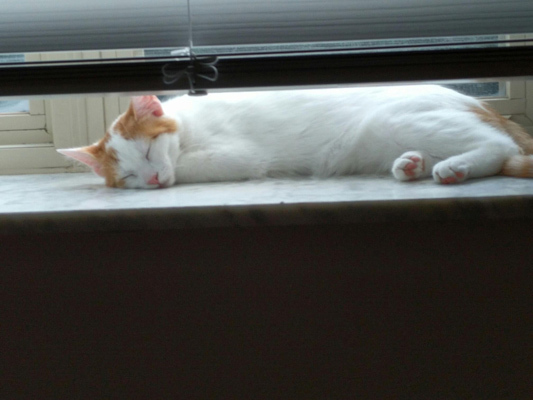 He has made himself very comfortable in my home since I adopted him and he sleeps pretty much wherever he feels like at the moment. He is eating very well and has had no problems. 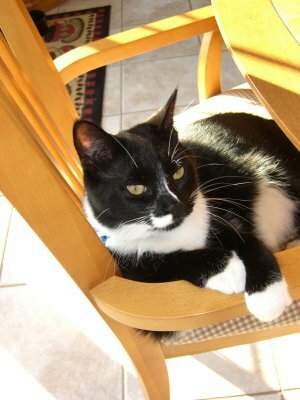 I have also been lucky enough that he has not scratched any of my furniture either! 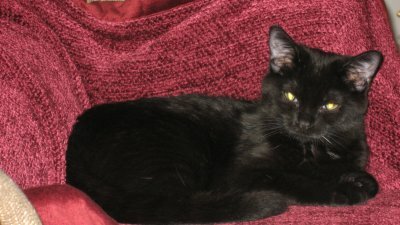 Here are 3 pictures of him relaxing/playing in my living room. 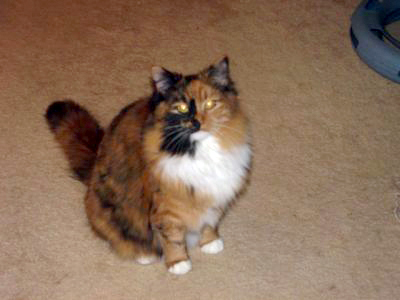 Lucy, formerly Snickers, was adopted in December 2011. 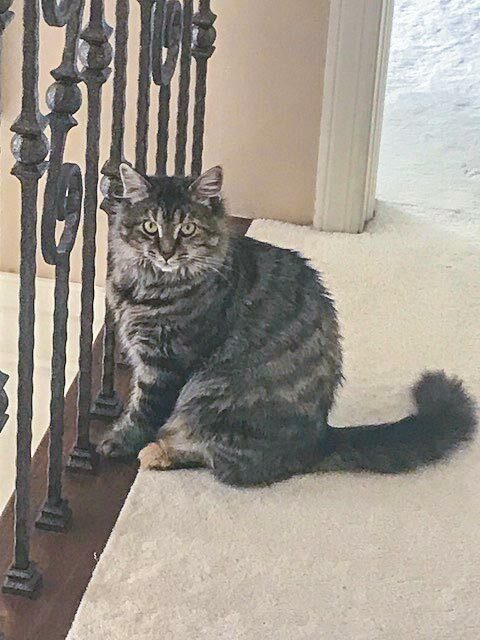 From Lucy's new home... 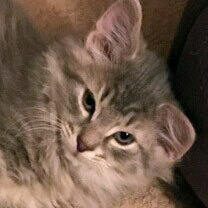 I renamed her Lucille but we only call her that when she is getting into trouble with her big brother Stewart so we mostly call her Lucy! 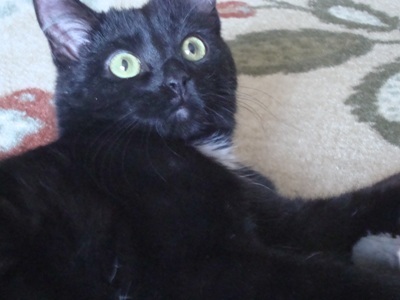 She is the most affectionate cat you could ever ask for and when you stop petting her she uses her little paws to grab your hands and ask for more! 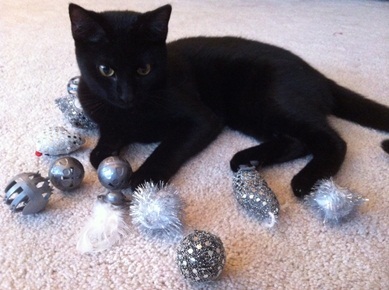 We still have our Christmas tree up so she loves to take the balls off the tree and play with them. She is the queen of the house and will just lay down anywhere! And she loves to take naps and snuggle. 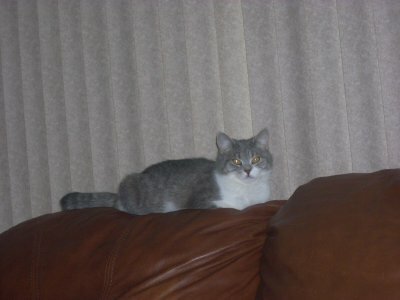 She is very energetic and loves to play with our other cat Stewart. 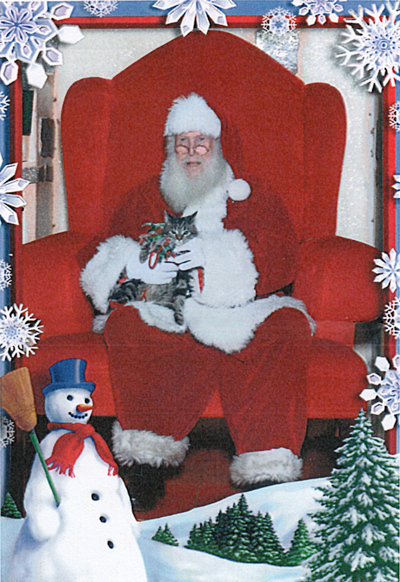 We do Christmas cards with Stewart so next year I will have to send you one of Lucy and Stewart in their Christmas outfits! I was looking for an addition to add to our family and she is the perfect fit, I absolutely LOVE her to pieces! 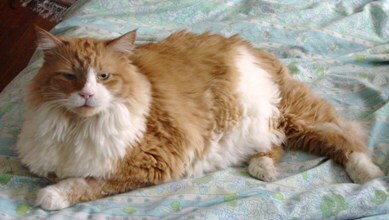 Rusty, formerly Cuddles, was adopted in October 2011. From Rusty's new home... We feel as though we've had her for years. She is very smart and knows our routine. She sleeps in our bed at night or on the chair. 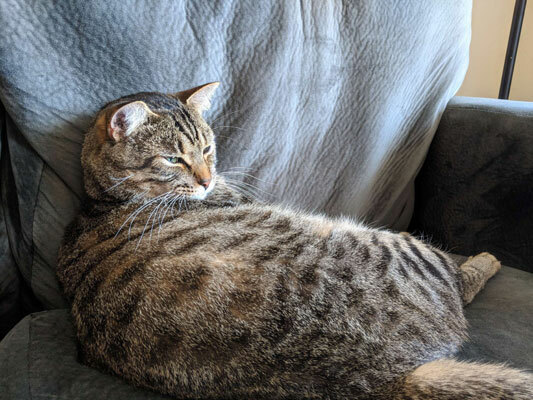 We usually get up at eight am, she goes to my husband and lets him know it's time to get up, he's the one that goes down and feeds her some wet food. She loves to sit on our laps, mostly mine. 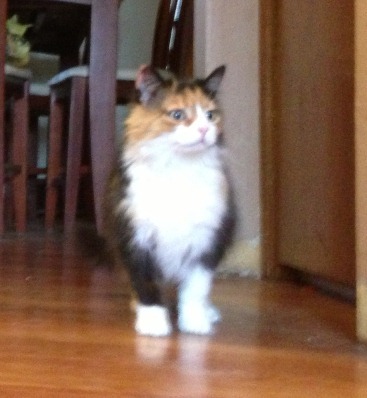 If we go into another room she follows us. We enjoy her so very much and happy to have her and we feel she is happy to be here with us. We changed her name from Cuddles to Rusty because of her coloring. 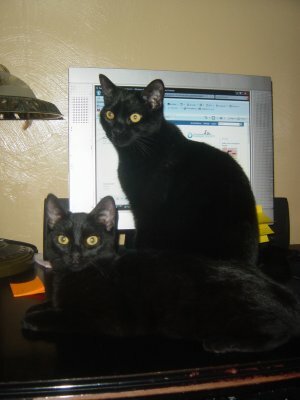 Jack and Jill were adopted in December 2011. From their new home... 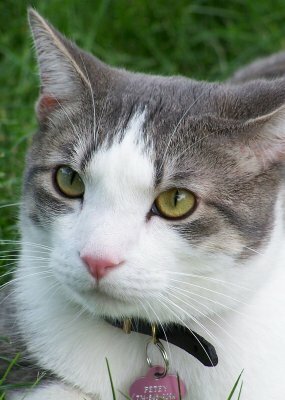 In all my years of owning cats, I have never encountered animals so calm or quiet in the carrier and the car! Not a peep out of them. Perhaps it helped that they were together; they drew strength from one-another. We are so happy to have Jack & Jill in our lives, and it's made a world of difference for Daniel. He needed some companions badly. 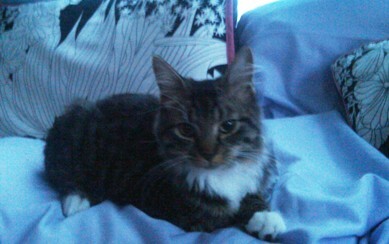 Here is a recent photo of Zoey (a.k.a. Buffy). 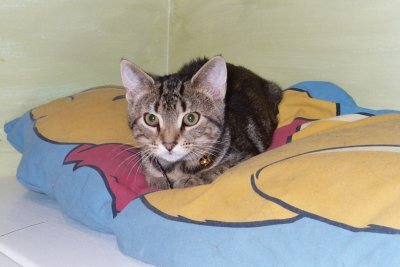 She is a real sweetheart and full of playful energy! 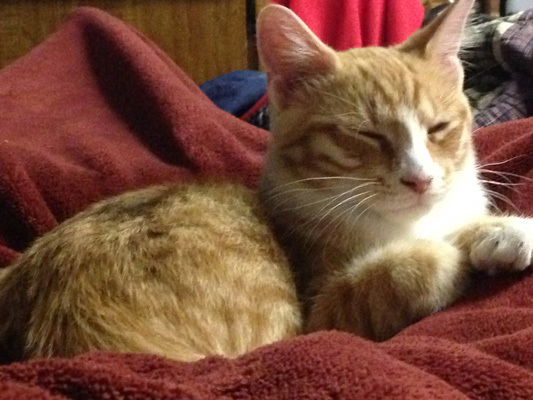 Skeeter is a great cat and he is settling in nicely. He gets along well with our small dog, Toby (Shih Tzu). 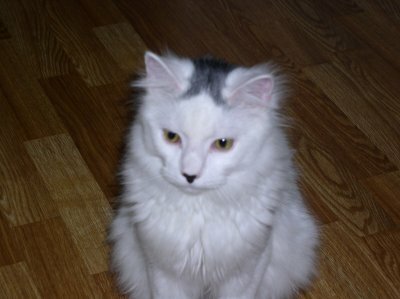 It would have been a terrible crime if this cat hadn't had a shot at life. 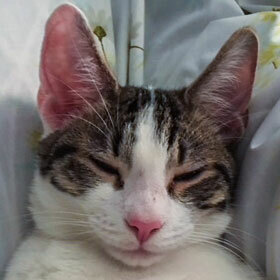 FosterCat is a most worthwhile organization. Diego is doing great! 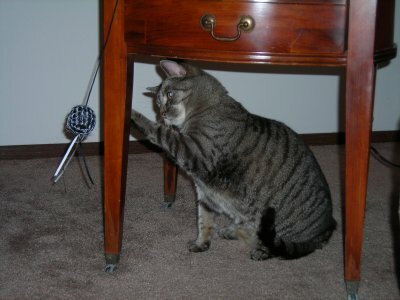 He's very playful and loves his jingle ball. 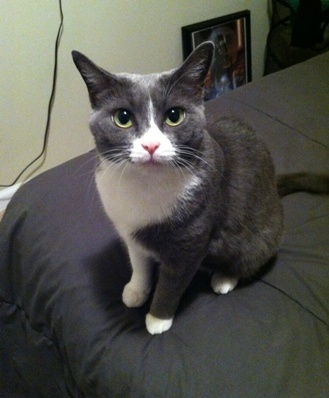 He's also very affectionate and loves to cuddle, especially in the morning. 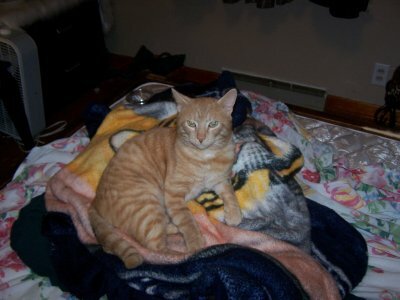 He adjusted to us very quickly and was wonderful when we had family members come visit. We're so happy to have him! Here are a few pictures that I had on my phone. In the second picture, he fell asleep while he was playing with his tail! 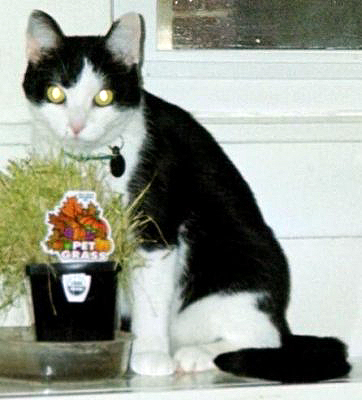 Tux was adopted in August 2011. From his new home... 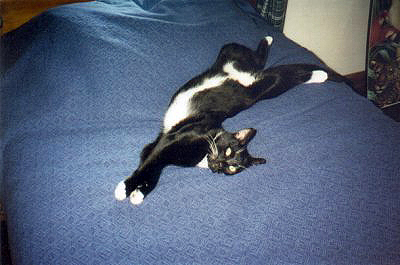 Here is a photo of my sweetheart, Tux, hanging out on my bed. He's so handsome I think he'd make a lovely addition to the newsletter! 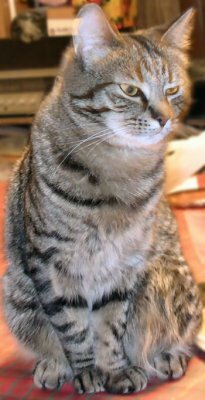 Sophia was adopted in August 2011. 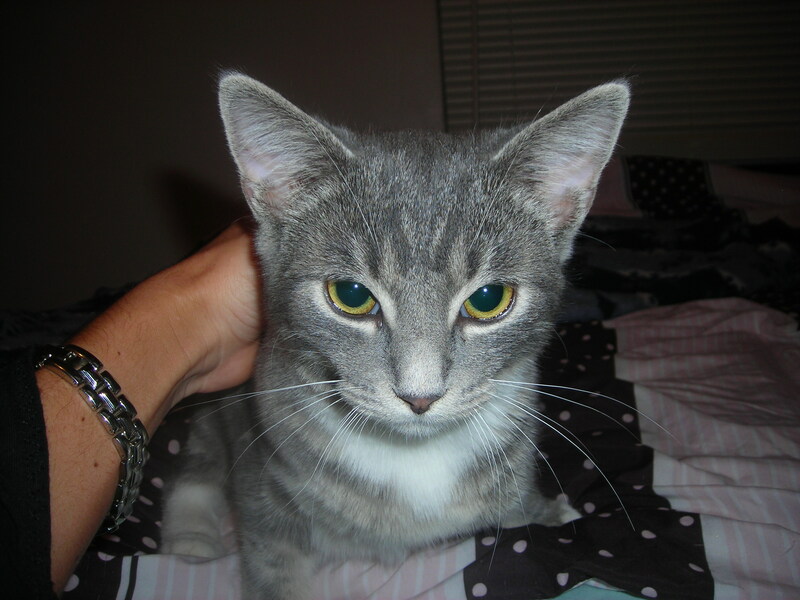 From her new home... Emily was so excited to get to PetSmart and bring Sophia home. Sophia and Hunter really hit it off! She is doing very well and enjoying her new home! Here are some pictures for you! 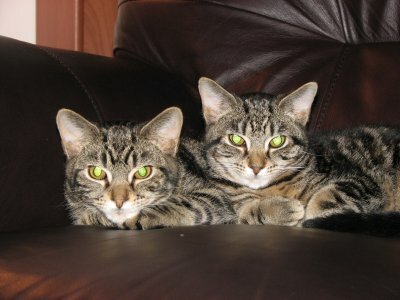 Grumpy and Tinkerbell (formerly House and Reva) were adopted in July 2011. 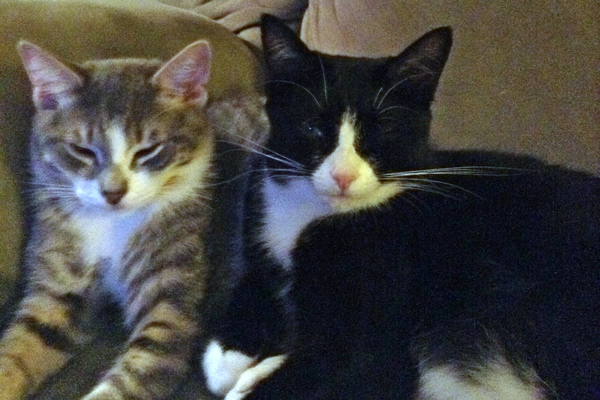 From their new home... Grumpy (Black and White) and Tinkerbell are adjusting well, and the girls love them! The kittens, especially Grumpy, are very tolerant of a toddler carrying them around. We love having them! Lilly was adopted in June 2011. From her new home... 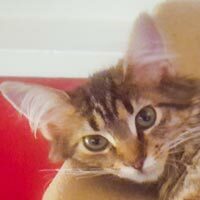 Here are some photos of Lilly - AKA 'Little Jazz'. 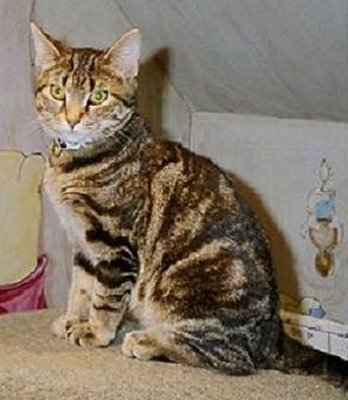 Our other Jazz, now called 'Big Jazz', and her look almost identical except for the small spot of white Jazz has under her neck & belly. Lilly is doing very well. We love her! 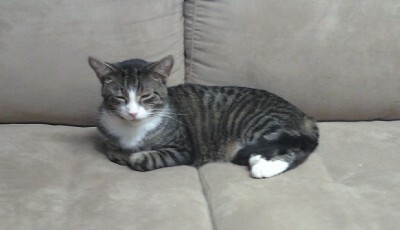 Oscar, formerly Meltaway, was adopted in June 2011. 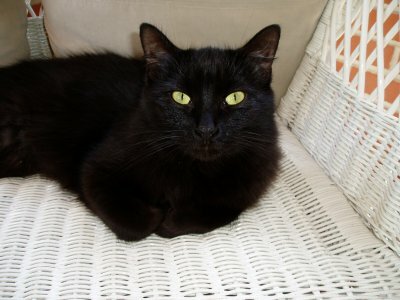 Jasper, formerly Truffle, was adopted in May 2011. 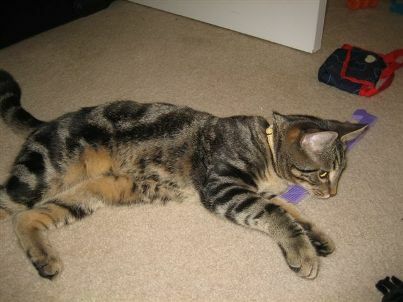 Mojo, formerly Aslan, was adopted in April 2011. 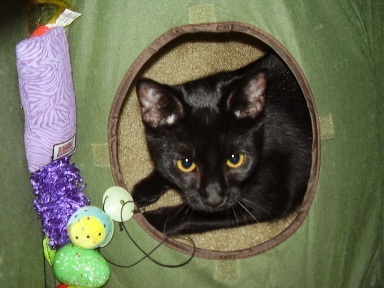 From his new home... Mojo is doing great! 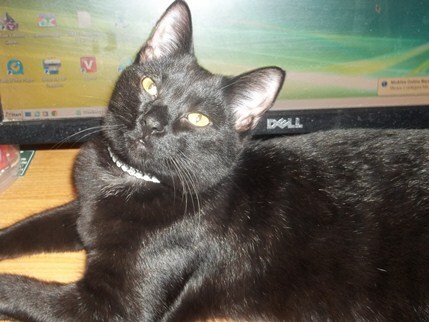 At times he can be bad, but most of the time, he is a sweetie. 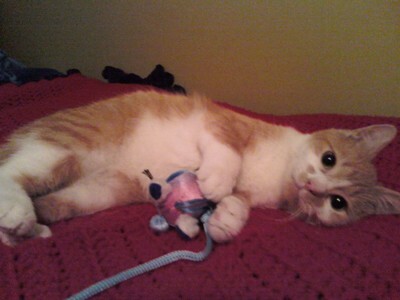 He loves to play and he is so affectionate. 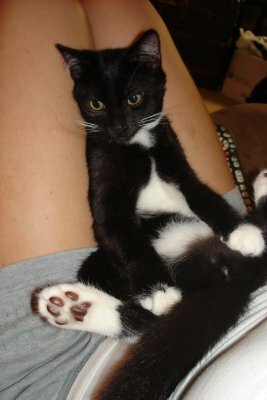 He has both of us wrapped around his paws! He has grown a little bit. 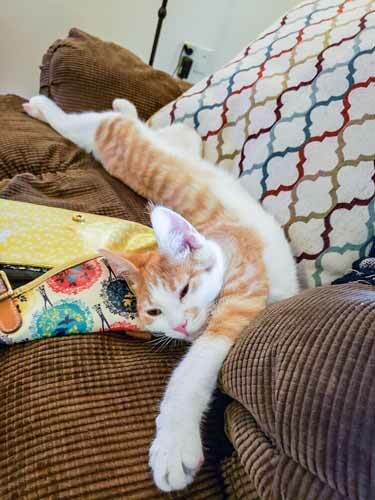 His tail does not seem to be so long now. He is not afraid of my grandkids or for that matter, anyone that comes to the house. 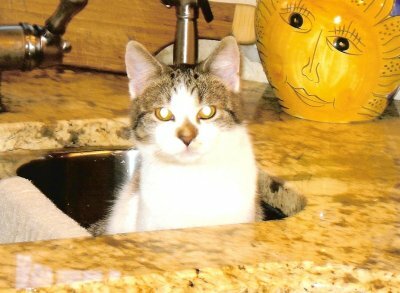 I have had cats in the past that hide when someone is here, but not Mojo! He likes to be the center of attention at all times! 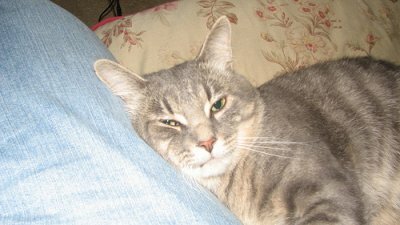 Gus, formerly Charlie, was adopted in March 2011. 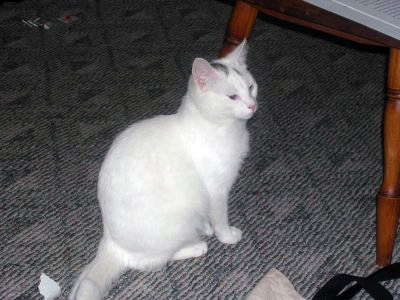 Whitey was adopted in March 2011. 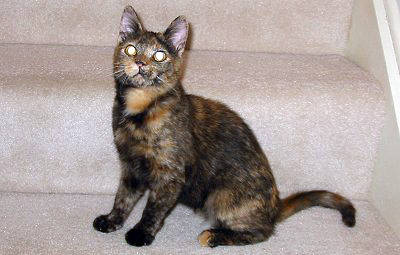 Hazel, formerly Marbles, was adopted in February 2011. 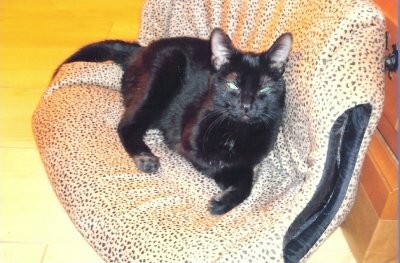 Bast, formerly Scout, was adopted in February 2011. Lacee is doing wonderfully and we love her so much already! She’s eating/drinking, exploring, using the litter box, and for the most part completely ignoring the bird! 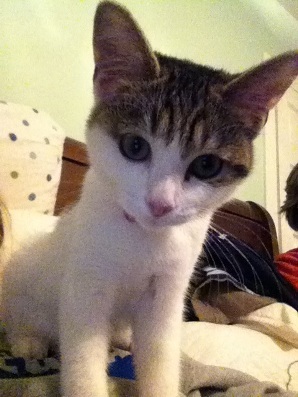 Right now she’s sitting on my lap 'helping' me type. Gracie was adopted in January 2011. 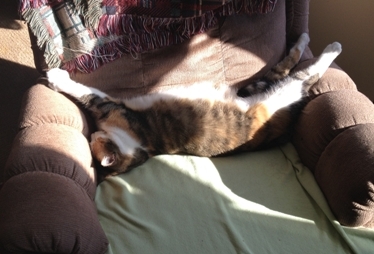 From her new home... Just want you to know that Gracie had no trouble adjusting to her new home. 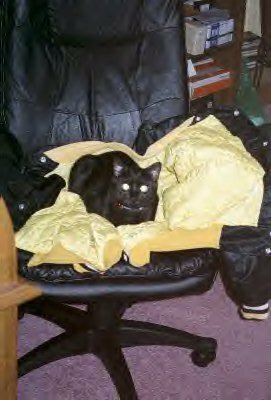 She took over my other cat's window napper as well as my livingroom chair. 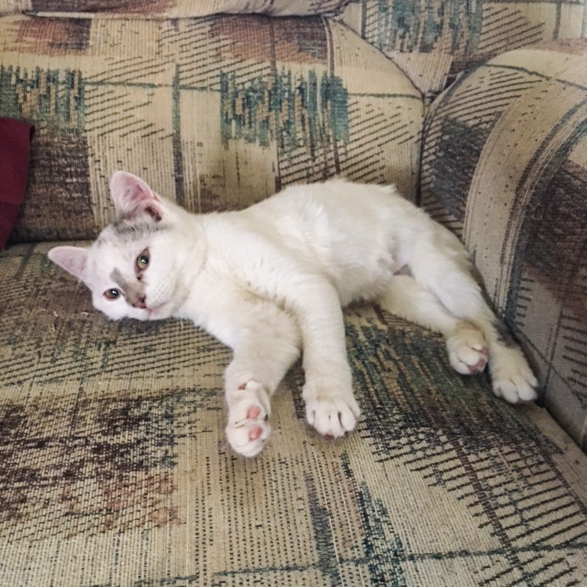 She is a sweet kitty & we love her. 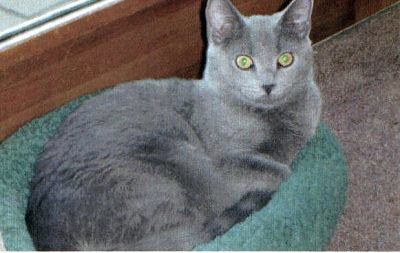 Winter was adopted in January 2011. 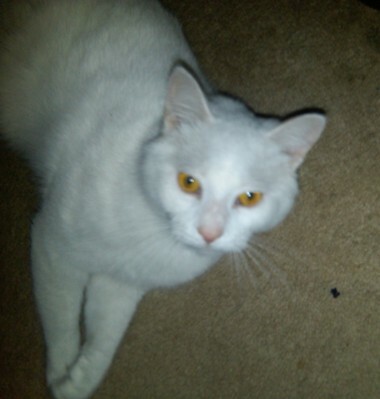 From his new home... Just thought you would like to see pictures of Winter in his new home. 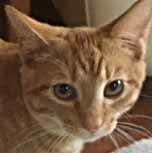 He is doing wonderful and getting used to 3 other cats. 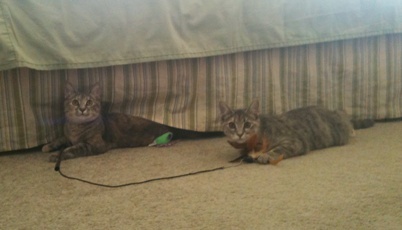 They are not friends yet but they are not hissing either. 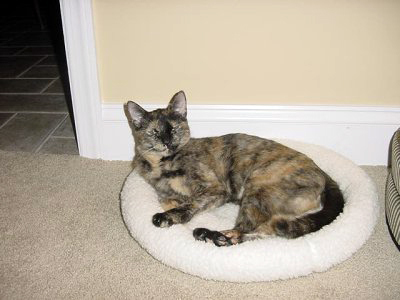 Mocha, formerly Honey, was adopted in January 2011. 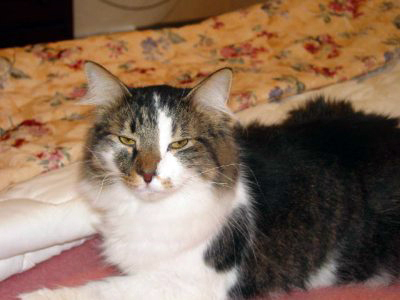 Chester was adopted in December 2010. 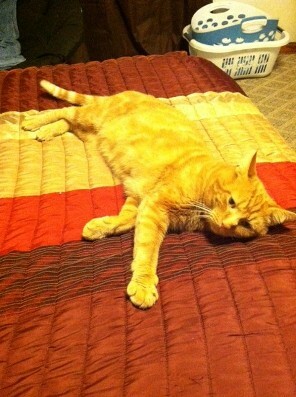 From his new home... Chester is doing just fine. Jim calls him his 'good boy'. 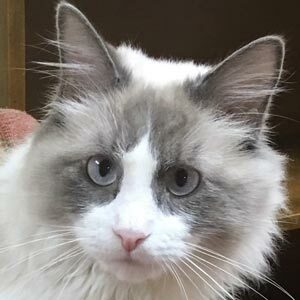 I call him 'Chester Kozlowski, III' because coincidentally, he's the third Chester in a prestigious lineage that includes Jim's father, Chester, and then Jim (his middle name). Sophie is adjusting to our family very well. 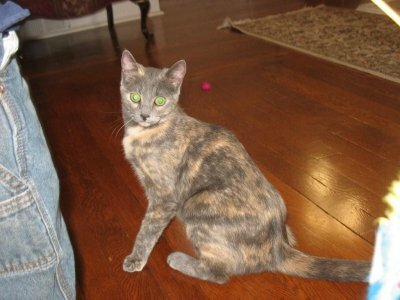 She is so sweet and friendly and the girls are loving having her. Emmett came around within the first few days and doesn't seem to mind having her around at all. 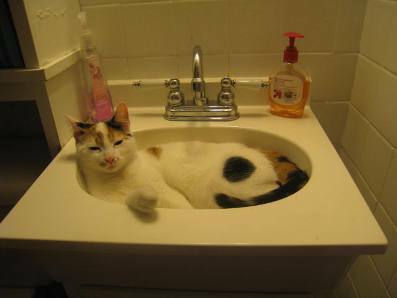 You can see how she's made herself at home (in the bathroom sink)! Thank you so much for bringing Abby into our family! 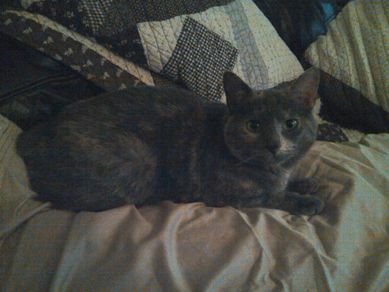 Here are some pictures of Rosa (adopted from PetSmart). 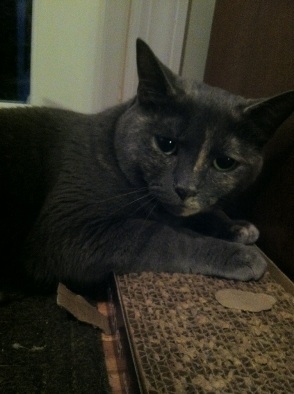 It’s hard to pick up her gray & tan colors. 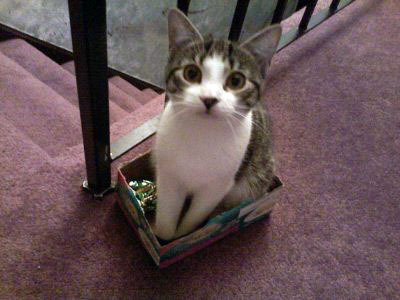 She’s so small and cute – only weighs about 5 pounds per my kitchen scale! 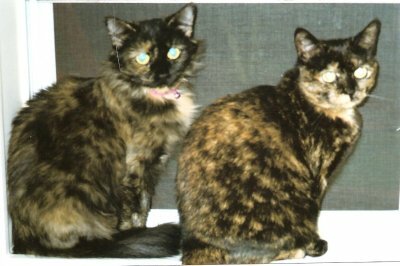 Brie and Luna (formerly, Fluffer and Marbels) were adopted in October 2010. 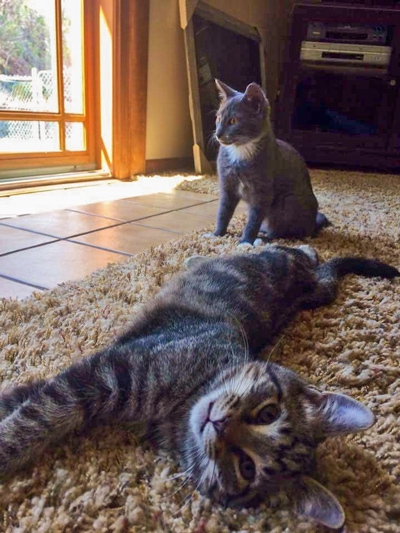 From their new home... Brie and Luna are great. 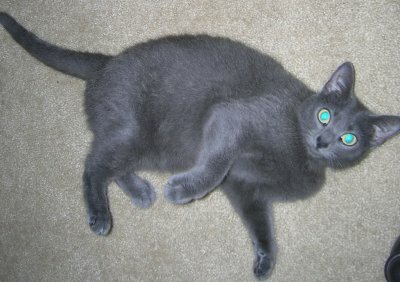 Luna is really growing, I think she is going to be huge. 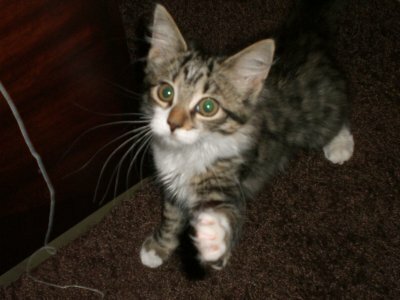 Brie is very playful. 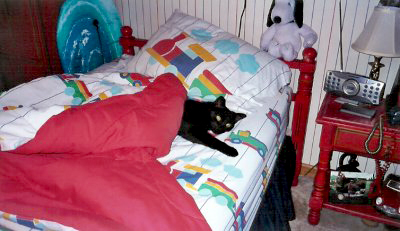 It is amazing - they are in bed with us from the time we go to bed until we wake up..
Teddy was adopted in October 2010. From his new home... Tonight we came home after dinner and he had made his way up to our bedroom and was sleeping very comfortably on Rosie’s bed. As you see in the picture. 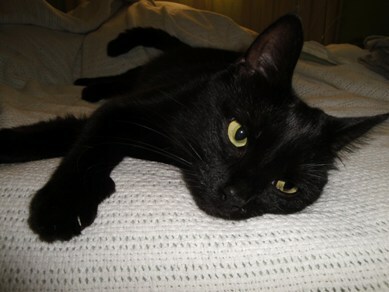 Rosie our dog has been great with him and so has Marmite our other cat, not best friends yet, but I think they will be. 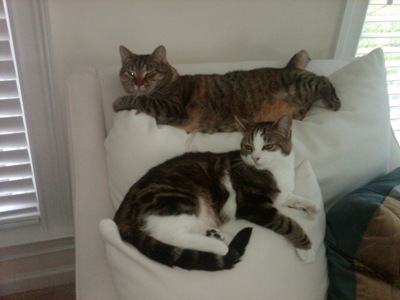 Tiger and Zoe (formerly, Tiger and Jitterbug) were adopted in August 2010. From their new home... These photos were taken on day two. They are adjusting well. Finding all the nooks and corners and getting use to all the sounds around them. 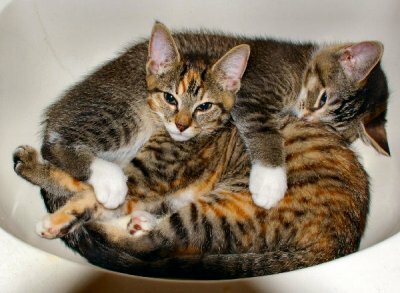 They are very affectionate and very loving. They are a real joy. Thank you. Everyone in my family just loves him. 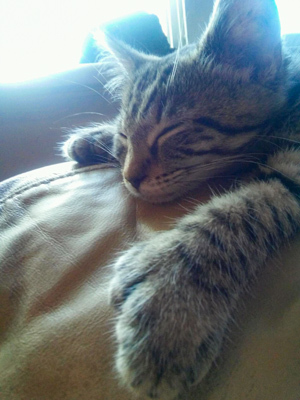 He is the sweetest kitten any of us has ever met. 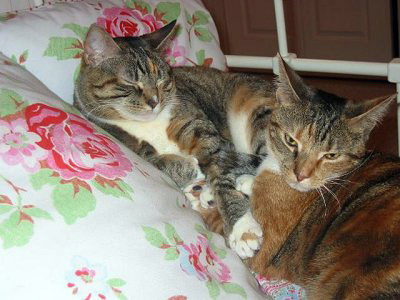 Penny and Sydney were adopted in July 2010. From their new home... 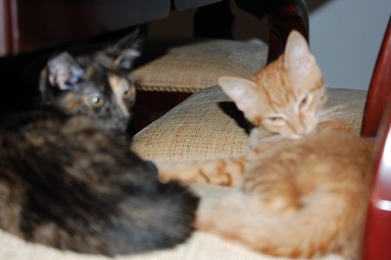 The kittens are adjusting very well, we named the orange cat - Penelope (penny for the orange) and the calico - Sydney. 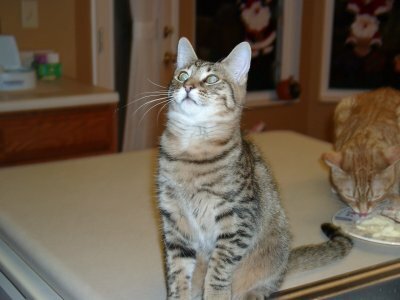 Penny is very outgoing and Sydney more shy, but they have each other which is nice and are great with the kids. We are truly enjoying their company. 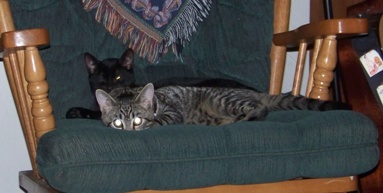 Teddy and Shadow (formerly Skittles and Bobby) were adopted in July 2010. 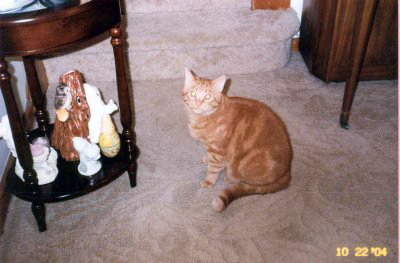 Tiger was adopted in June 2010. 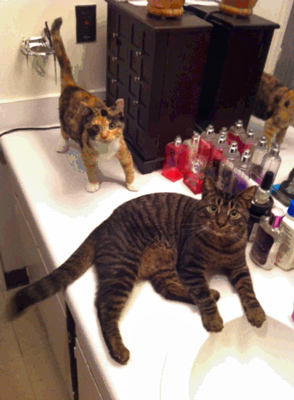 Pictured with Tiger are former FosterCat alums, Fiona and Sweet Pea. From his new home... Here are pics of our newest baby. Also I sent one of the three of them together on my lap. That is the first time all three have been together in one place. Could you please post the three of them on the website and maybe put them in the newsletter. 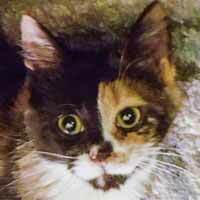 We are TRULY grateful to Foster Cats for your help. We LOVE these new additions to our home and treasure them daily. 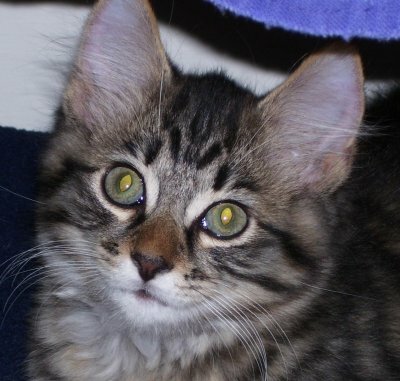 Our newest is named Tiger because he really is a little tiger. We have to stop working just to watch him play with his sisters and brother. He can even entertain himself in the most amusing ways. Luna was adopted in May 2010. 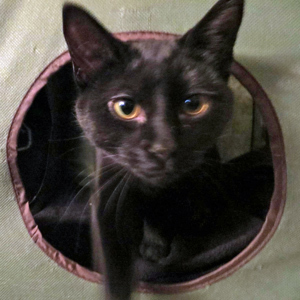 From Luna's new home... Luna is fantastic! 3 years old now... 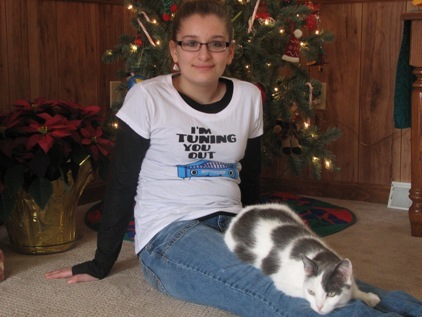 Her and my boyfriend are very close now too, but she shows her loyalty to me that is for sure! 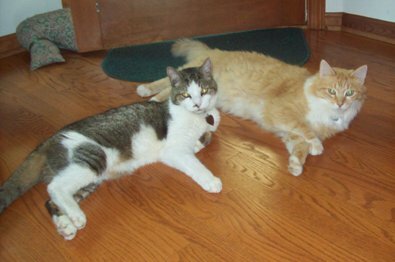 Hampton and Ziggy (Orange Tabby) were adopted in May 2010. 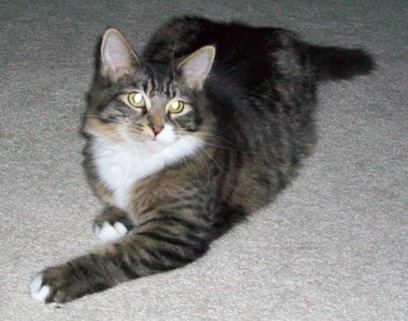 Salinger was adopted in March 2010. From his new home... 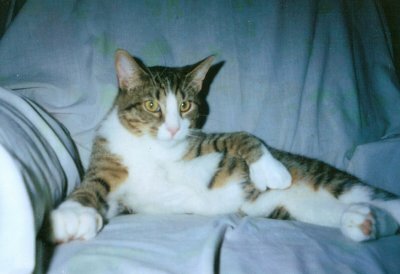 He's the coolest cat we've ever seen. He follows us around like a dog, and plays with our daughter wherever she goes. It's a blessing to have him as a new member of our family. Joey was adopted in March 2010. 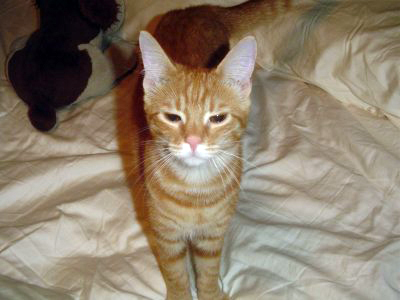 Blaze, formerly Charlie Brown, was adopted in March 2010. 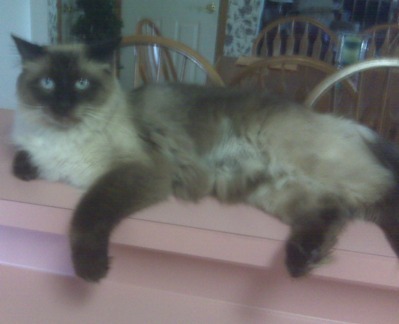 Gizzy, adopted in February 2010. From his new home... 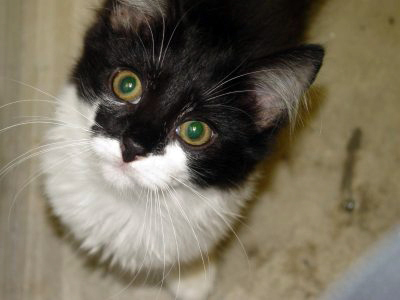 He is just so affectionate and expressive, you know what he wants (almost:). 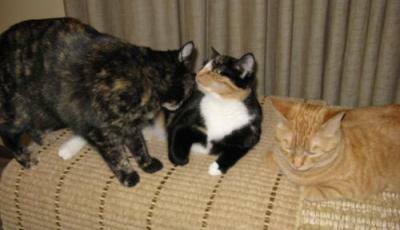 Honey (Torti), Sunny (Calico), and Jasmine (Orange Tiger) were adopted in January 2010. From their new home... I feel like the Pied Piper; they follow me everywhere! 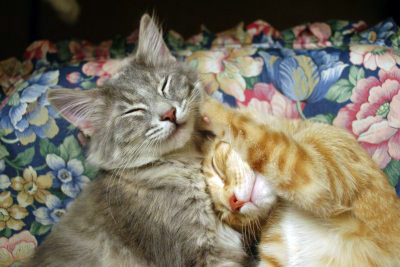 I am so glad that I adopted them. I love them, and they love me. 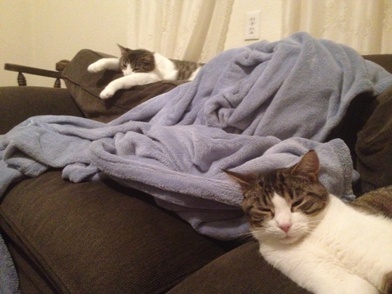 My kitties are so much fun and wonderful company. 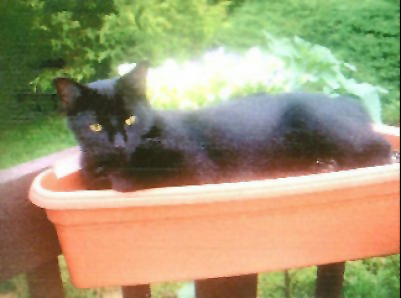 Sweet Pea, formerly Sooty, was adopted in January 2010. 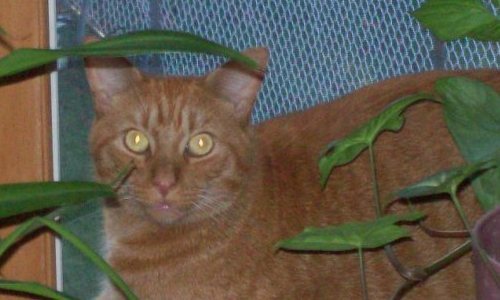 Bru, adopted in January 2010. 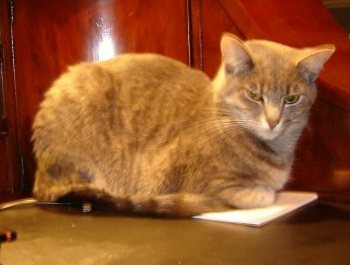 Henry was adopted in 2009. Jake (formerly Jeff) was adopted in December 2009. 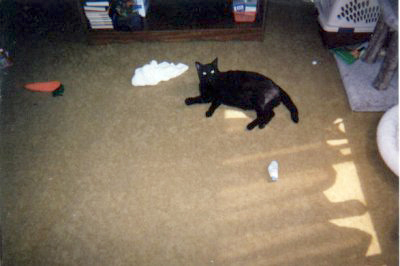 From his new home... Jake has taken over the entire house, is spoiled, playful, beautiful, extremely smart, very friendly with people, and a constant companion to my husband, especially when he came home from the hospital. 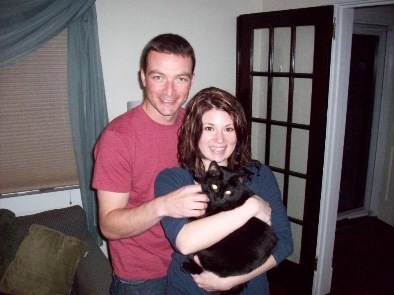 Midnight was adopted in March 2009. 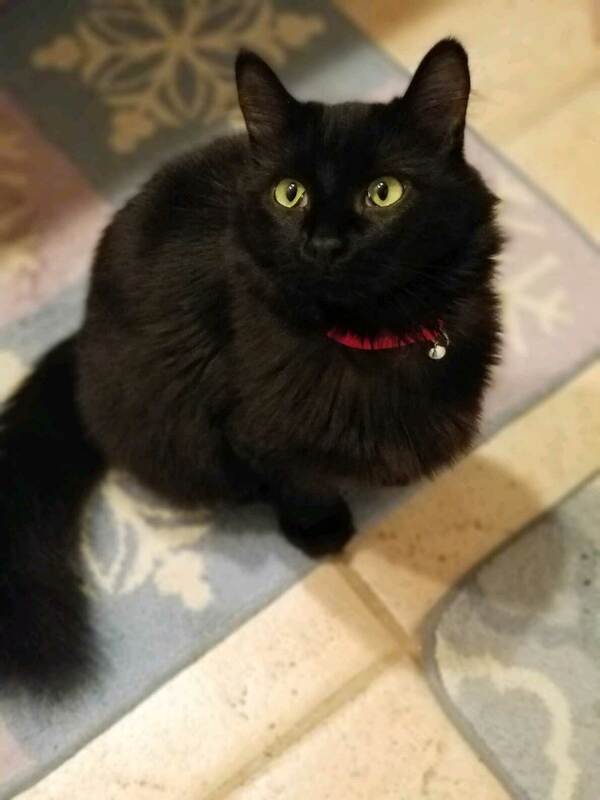 From her new home... My wife and I adopted Midnight last spring. It was one of the best decisions we've ever made. 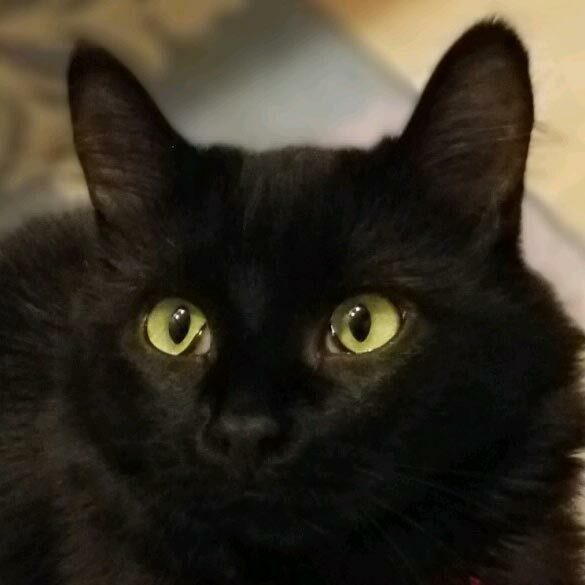 Midnight is so gentle, sweet, and beautiful. Sissy was adopted in December 2009. Here she is sunning herself in 2011! 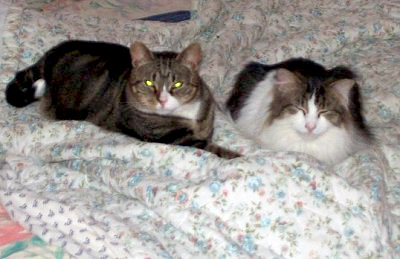 Timmy and Missy, formerly, Milo and Lillian, were adopted in November 2009. 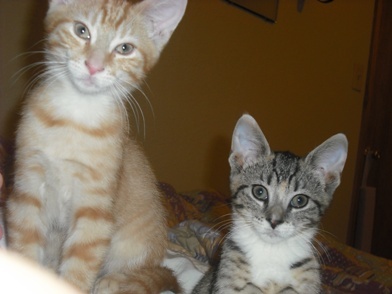 From their new home... Lilian is now my mischevious Missy and Milo is now my timid Timmy. I love them so much and I am so happy I decided to adopt 2 of them. 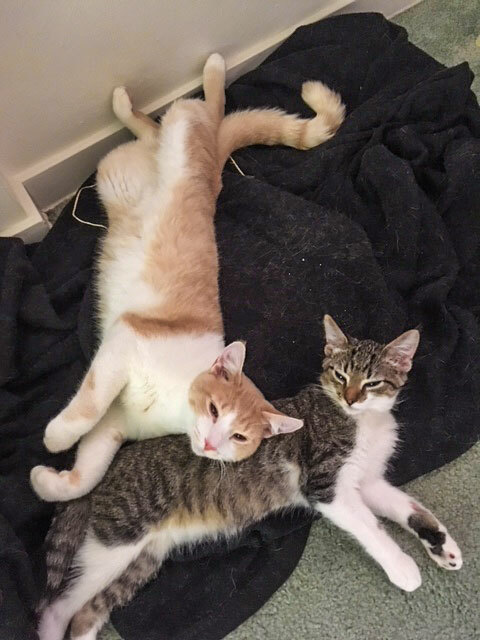 They are inseperable and the transition with them into the house and introduction took some time but, they all play well and love each other, too! 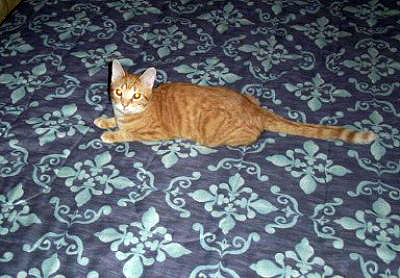 Kiwi (formerly Baby) was adopted in December 2009. 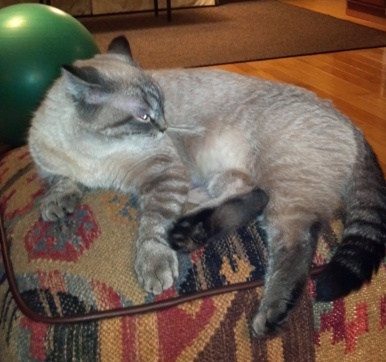 From her new home... She is gorgeous and sweet, and best of all, very affectionate! 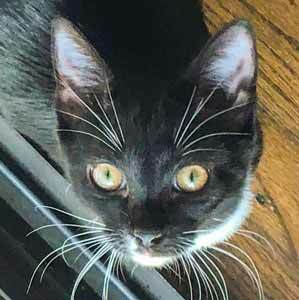 Since I have not had a cat since I was a child, I had forgotten how playful and fast kittens could be - she makes my two labs seem like they are always moving in slow motion. 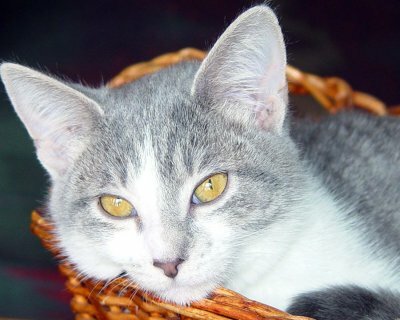 I am enjoying her sooo much and can't imagine life without her in our little menagerie! 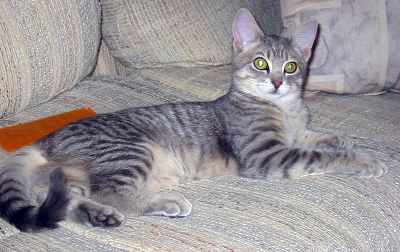 Tigger, formerly, Silver, was adopted in December 2009. 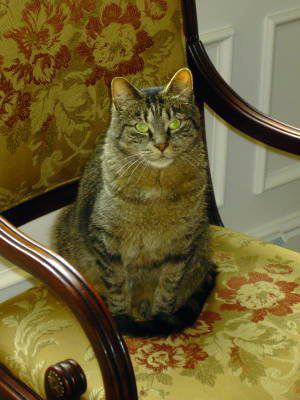 Maggie, adopted in July 2009. 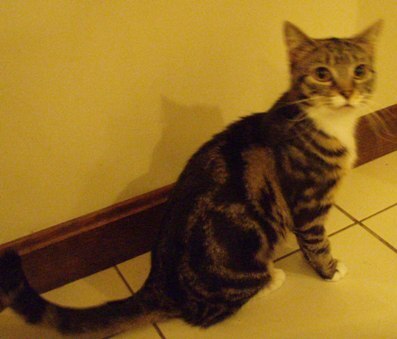 Fiona, adopted in March 2009. 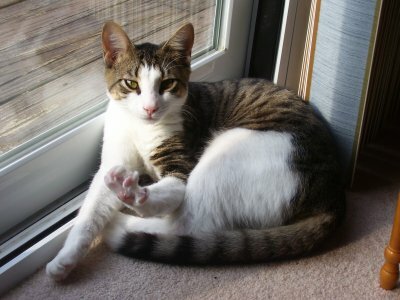 Charlie, adopted in December 2009. 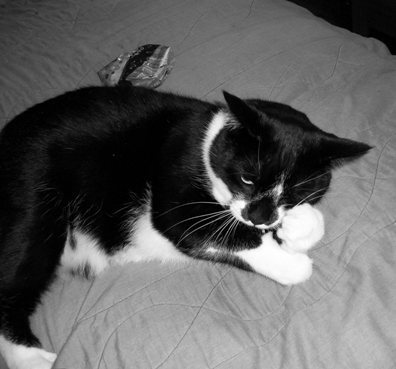 Booey, adopted in December 2009. 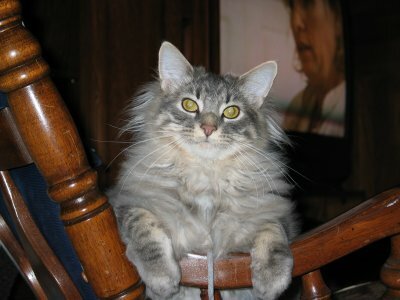 Lilly, formerly Puffy, adopted January 2009. 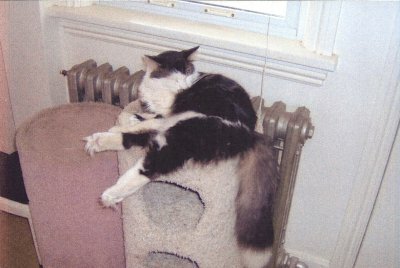 Spenser, formerly Teddy, adopted January 2009. 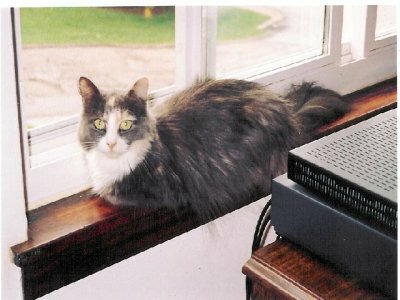 Maggie, formerly Mitzi, adopted July 2009. 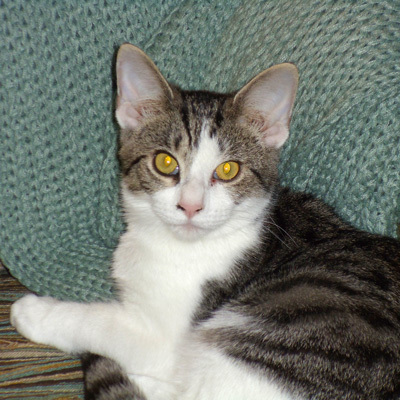 Tanner, formerly Linus, adopted April 2009. 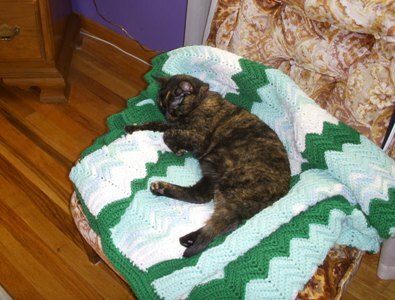 Callie (now Meatball) was adopted in September 2009. She is doing very well. She is still affectionate as ever. When I sleep at night, she falls asleep on me and now she puts her face on mine. I do not have the heart to move her, but her purring puts me to sleep. Also, when she does not like the moist food I give her, she puts her toy mouse in there to let me know I am doing something wrong. 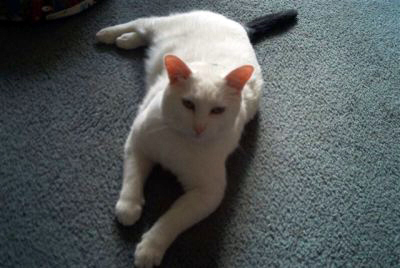 Jackson was adopted in August 2009. 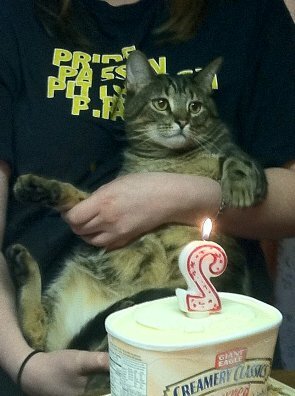 Here he is celebrating his 2nd birthday! 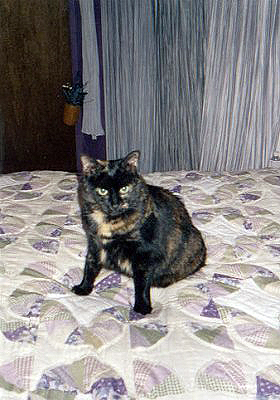 Gracie (formerly Snickers) was adopted in September 2008. She's such a delight and as you can see as beautiful as ever! Merry Christmas! 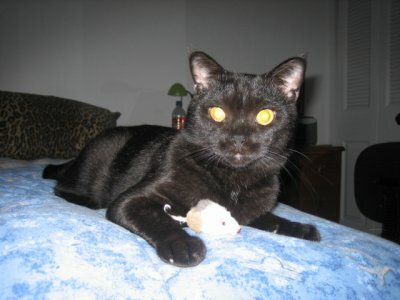 Dexter, formerly Christopher, adopted April 2008. 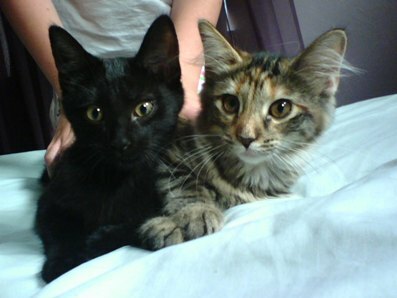 Zoey (formerly Sabrina) adopted 08/08 and Naomi (formerly Jezebel) adopted 12/07. 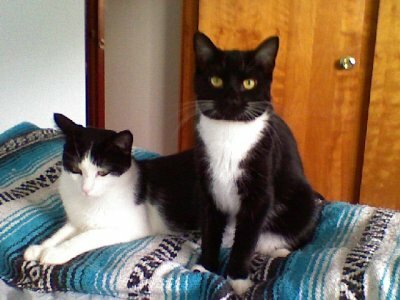 Jack and Diane, formerly Juliet, Diane adopted June, 2007. 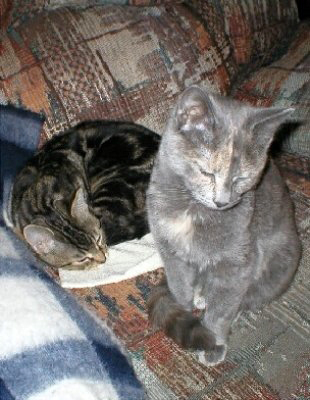 Banshee and Spike, adopted June, 2007. 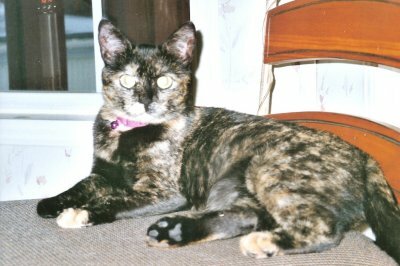 Amber, formerly Elizabeth, adopted July 2007. 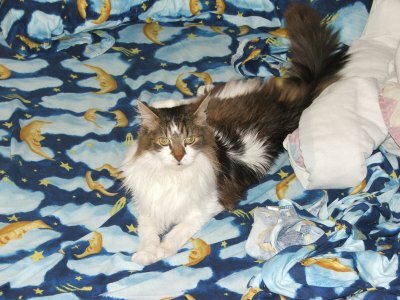 Shakespeare, formerly Miracle, adopted August, 2007. 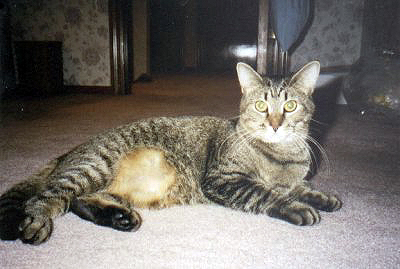 Oscar, formerly Tabby, adopted August, 2007. 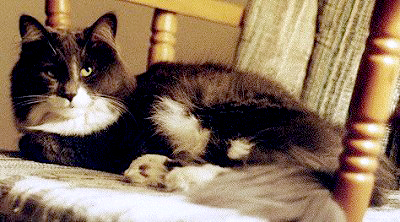 Oreo, formerly Curly, adopted August, 2007. 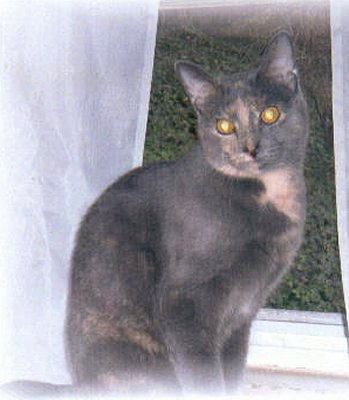 Sally, formerly Ciao, adopted November, 2007. 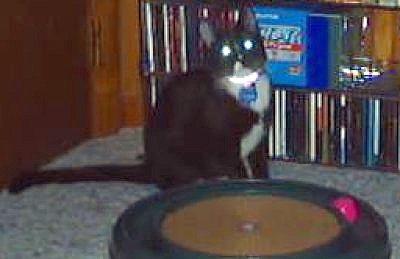 Jax, formerly Bingo, adopted December, 2007. 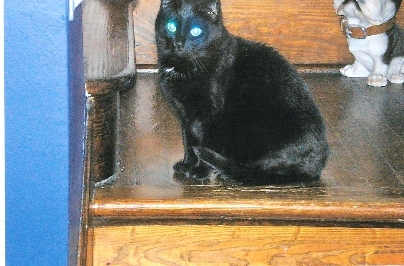 Naomi, formerly Jezebel, adopted December, 2007. 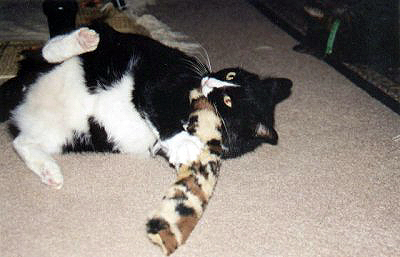 Biggie, fomerly Bingo, adopted December, 2007. 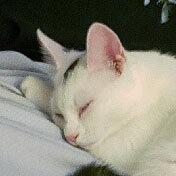 Emi, formerly Cinders, adopted December, 2007. 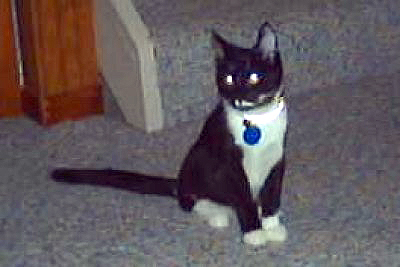 Maura, now Mauri, adopted February, 2006. 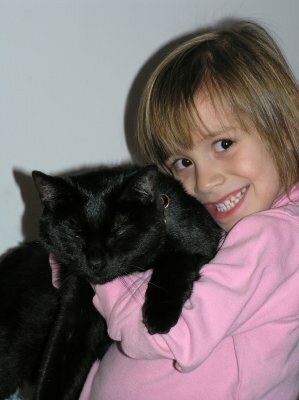 Emily and Kramer, adopted June, 2006. 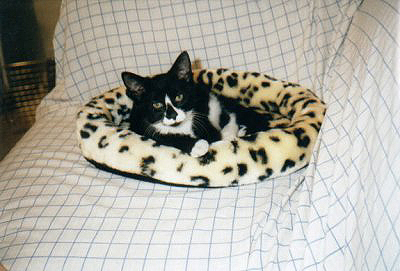 Bart, now Nice Boy, adopted July, 2006. 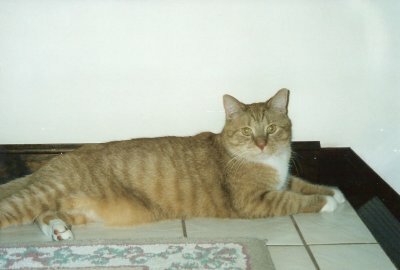 Rocky, now Simon, adopted July, 2006. 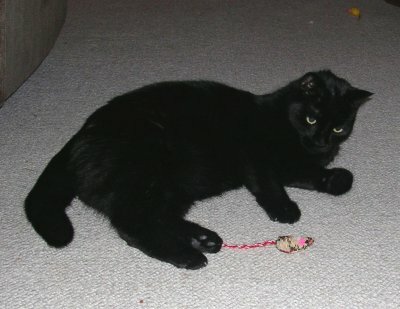 Saylim, now Ernie, adopted August, 2006. 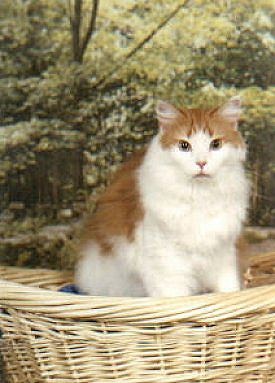 Killian, now Jan, adopted August, 2006. 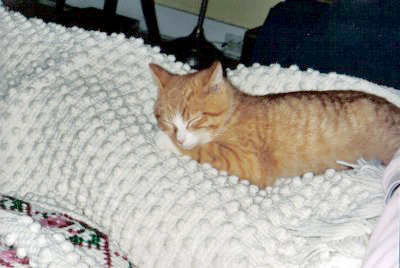 Leo, now Ernie, adopted August, 2006. 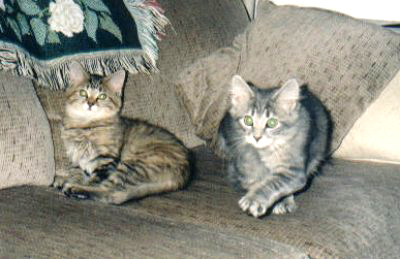 Abigale & Tabitha, now Sugar and Spice, adopted September, 2006. 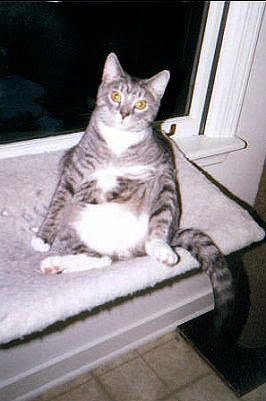 Levi, now Bert, adopted September, 2006. 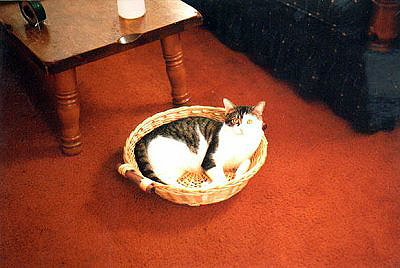 Luke, now Cookie, adopted September, 2006. 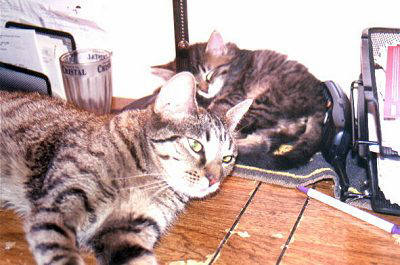 Gobo & Mokey, now Ricky & Lucy, adopted December, 2006. 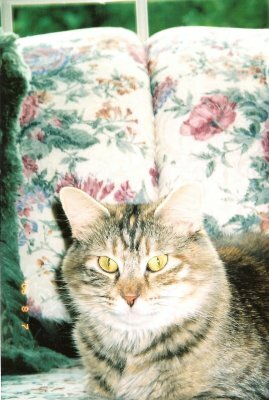 Trixie, now Tiger Lilly, adopted December, 2006. 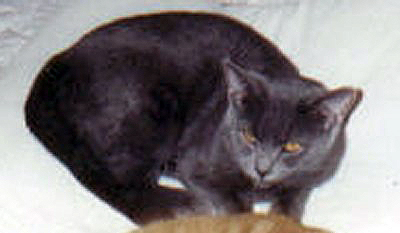 Frisky and Possum, adopted February, 2005 and 2002. 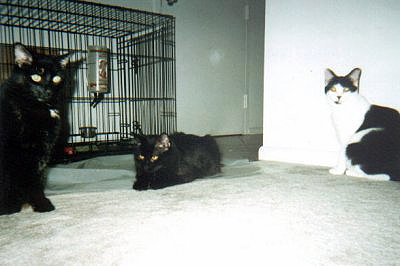 Turbo and Razzle, adopted July, 2005.
Pepper, formerly Edward, adopted August, 2005. 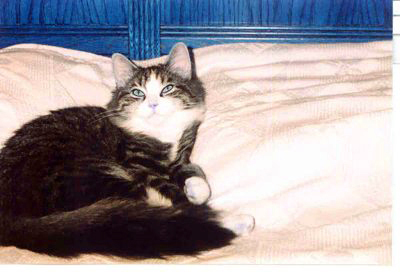 Ellie Jo, adopted September, 2005. 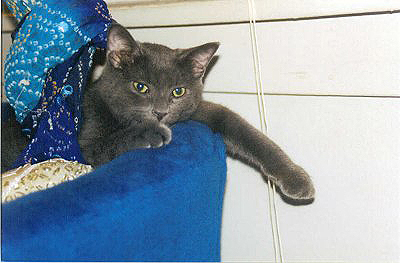 Smokey, formerly Eugene, adopted September, 2005. 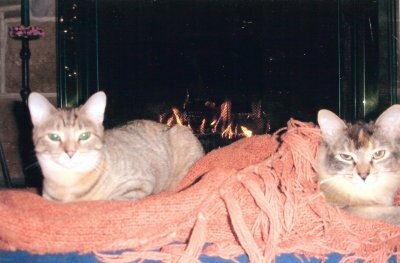 Annabelle & Rusty, formerly Penny & Bobby, adopted October, 2005. 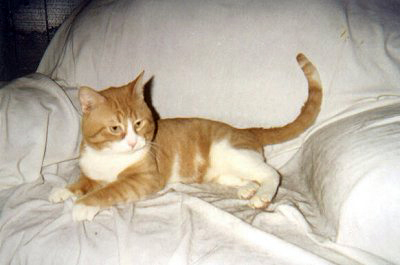 Sam, formerly Buzzy, adopted October, 2005. 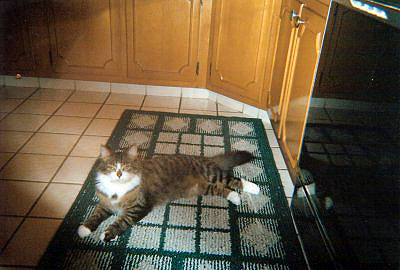 Willy, formerly Whisky, adopted November, 2005. 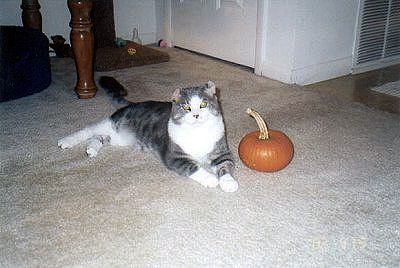 Buddi, formerly Clark, adopted November, 2005. 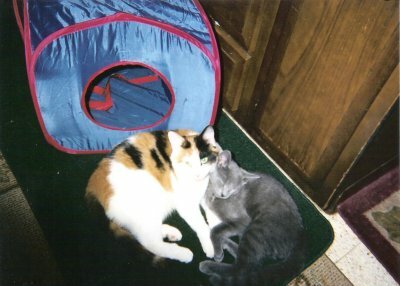 Cupid & Riley, adopted November, 2005. 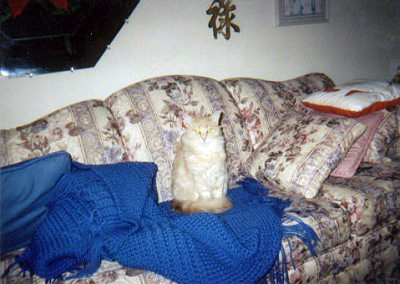 Misty Lee, adopted December, 2005. 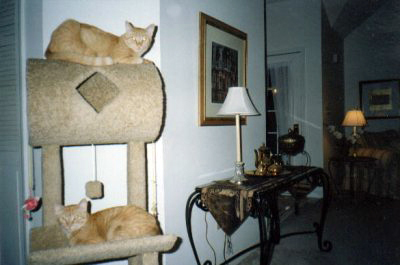 Ted and Winston, formerly Bert and Ernie, adopted January, 2004. 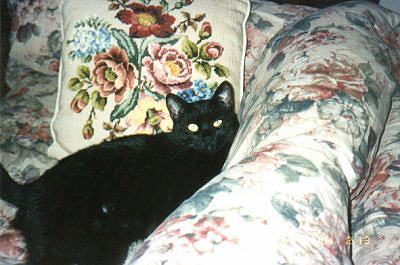 Shadow, formerly Angel, adopted January, 2004. 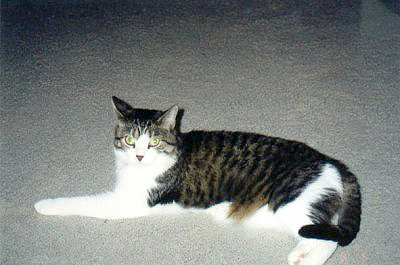 Nikki, formerly Kitten 10, adopted February, 2004. 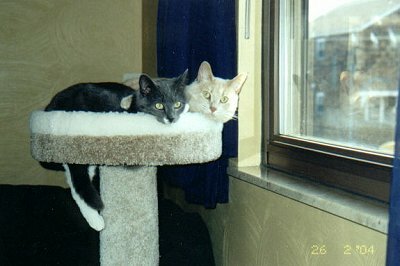 Andy and Max, adopted February, 2004. 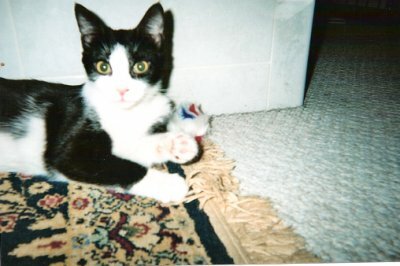 Bobby Jo, adopted May, 2004. 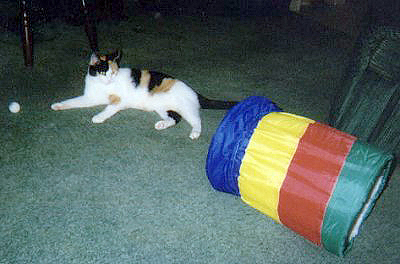 Lucy, formerly Marjarana, adopted May, 2004. 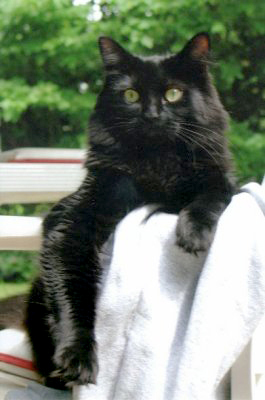 Salem, formerly Marlin, adopted September, 2005. 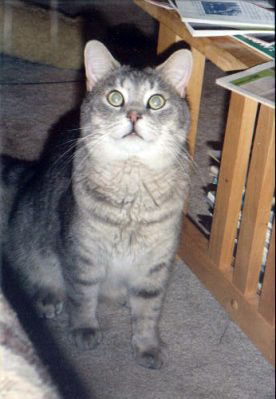 Junior, formerly Lance, adopted August, 2004. 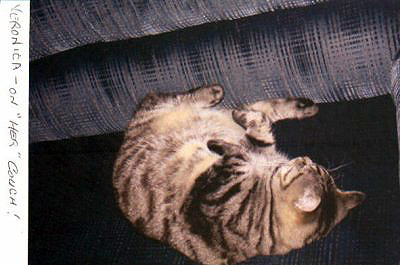 Sammie and Max, adopted October, 2004. 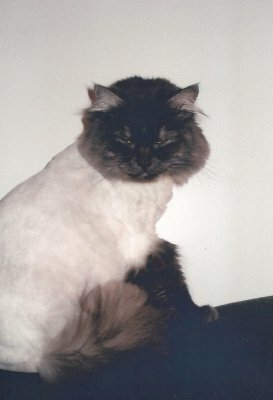 Cosmo, formerly Buttercup, adopted November, 2004. 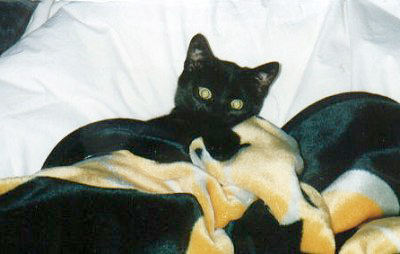 Stewie, formerly Pistol, adopted December, 2004. 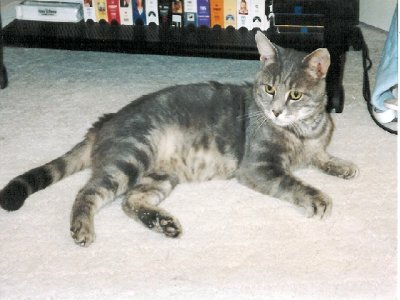 Dewey, formerly Tiger, adopted December, 2004. 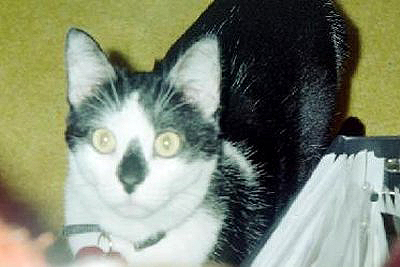 Dillon, formerly Rocky, adopted December, 2004. 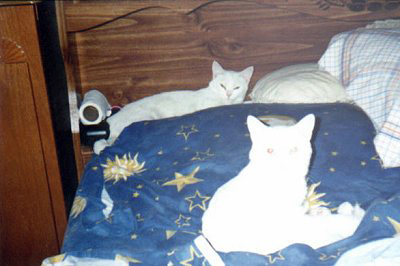 Angel and Frosty, adopted January, 2003 and August, 2002. 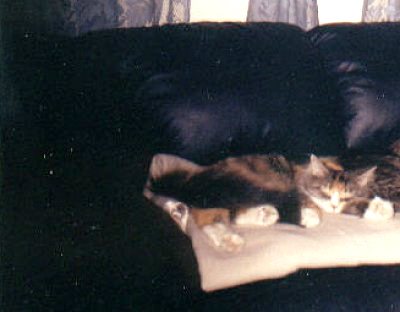 Tabitha and Mogie, adopted January, 2003. 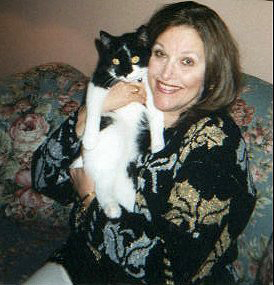 Priscilla and Elvis, adopted February, 2003. 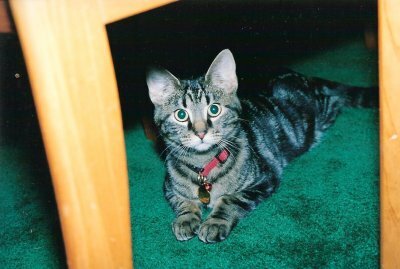 Little Bit, adopted March, 2003. 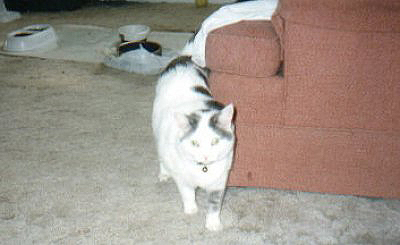 Sam, formerly Dallas, adopted June, 2003. 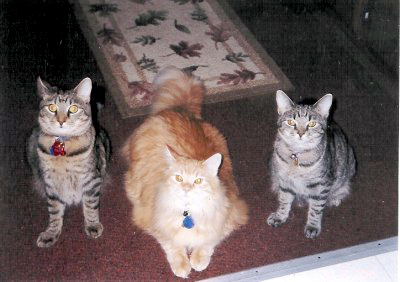 Bandit, Jamie and Jason, adopted August, 2003. 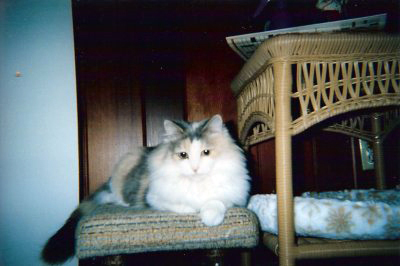 Fluff, formerly Clarissa, adopted October, 2003. 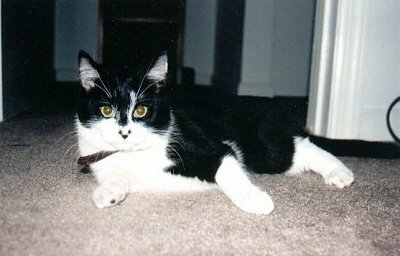 Sabrina, formerly Whiskers, adopted October, 2003. 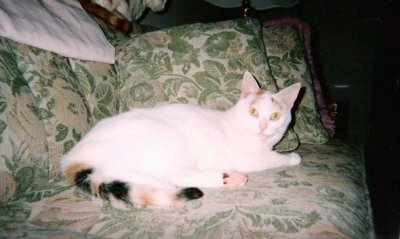 Stella Blue, adopted November, 2003. 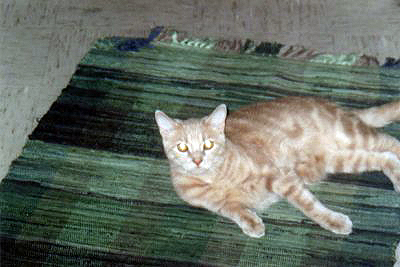 Peaches Puss, adopted November, 2003. 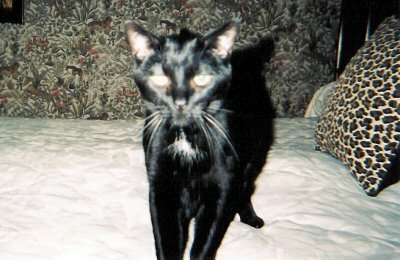 Ethan Calin Hunter, formerly Boogie Woogie, adopted December, 2003. 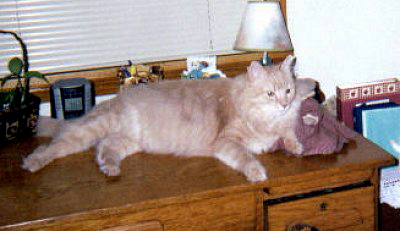 Amos, formerly Ricky, adopted January, 2002. 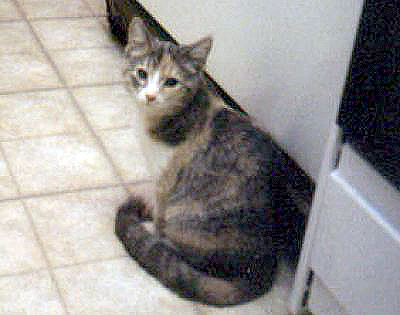 Courtney, formerly Cordy, adopted June, 2002. 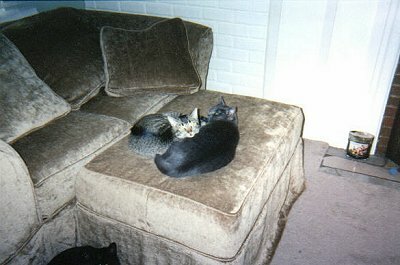 Gracie, Little Bear & Luna, formerly Pixie, Little bear & Luna, adopted August and December, 2002. 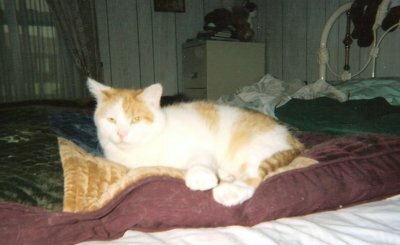 Angel & Frosty, adopted January, 2003 and August, 2002. 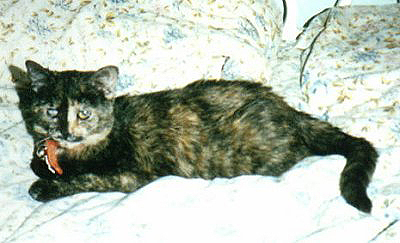 Sara Lee, adopted November, 2002. 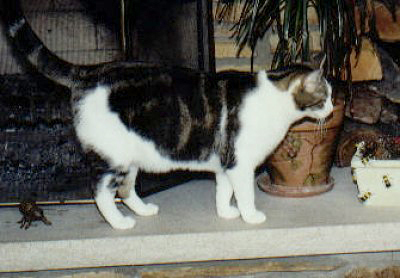 Stars & Stripes, adopted November, 2002. 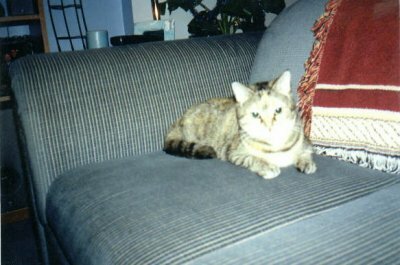 Maddie, formerly Kitten #2, adopted December, 2002. 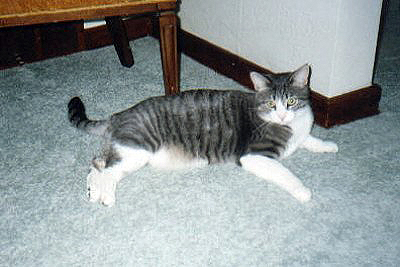 Flop, formerly Bullseye, adopted December, 2002. 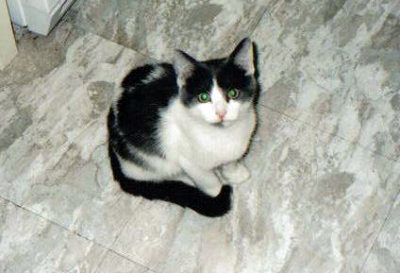 Oreo, formerly Split, adopted December, 2002. 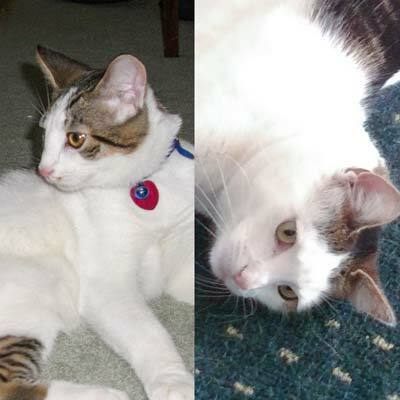 Taz and Christopher, adopted February, 2001 and February, 2002. 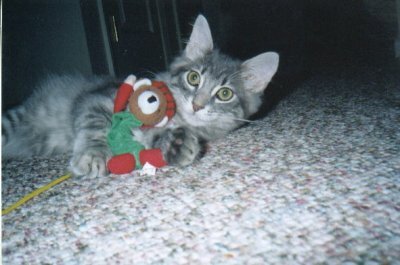 Ziggy, formerly Shopping Center Kitten, adopted August, 2001. 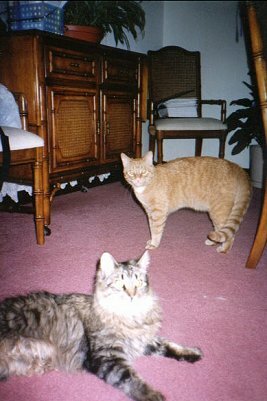 Tigger & Pooh, formerly Tigger II & Blue, adopted November, 2001. 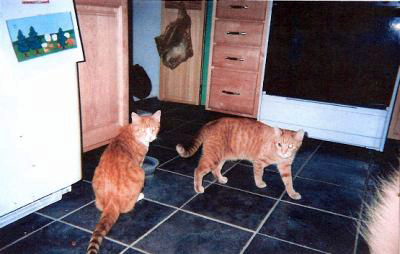 Clyde & Donnie, formerly Schwabells & Rascal, adopted November, 2001. 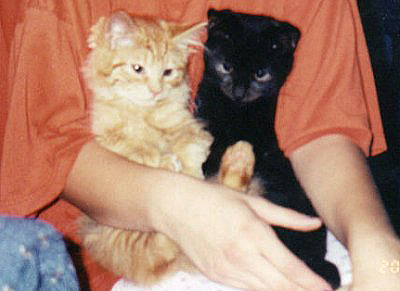 Rose Grey & Sam Orange, adopted November, 2001. 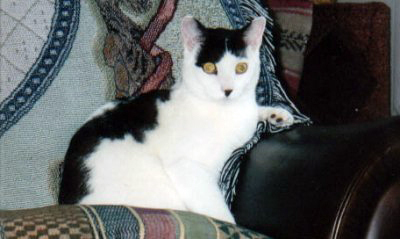 Ziggy, formerly Cathi's Kitten, adopted December, 2001. 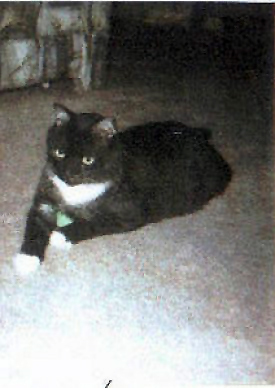 Floyd, formerly Jingles, adopted December, 2001. 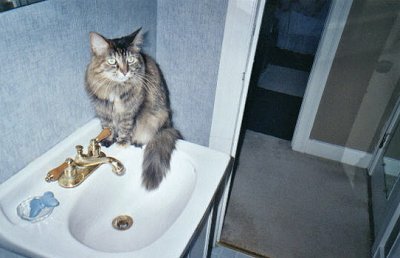 Pretty Girl, formerly Chloe, adopted October, 2000. 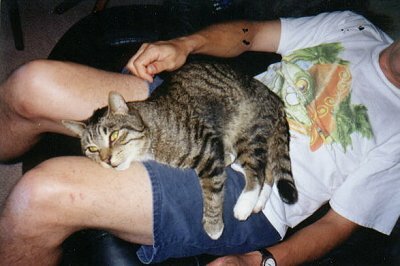 Mugsy, formerly Cleo, adopted November, 2000.